So you are dreaming of a wildlife safari, of experiencing the thrill of coming face to face with wild animals on their own turf. But which safari destination should you choose? 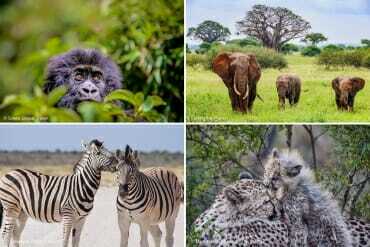 With more than 6,000 national parks across the world and more than 15,000 species of birds and mammals alone, choosing safari holidays destination can be a daunting task. To help you choose your ultimate wildlife adventure, I teamed up with the global community of travel bloggers and asked them to reveal their top wildlife watching destinations. 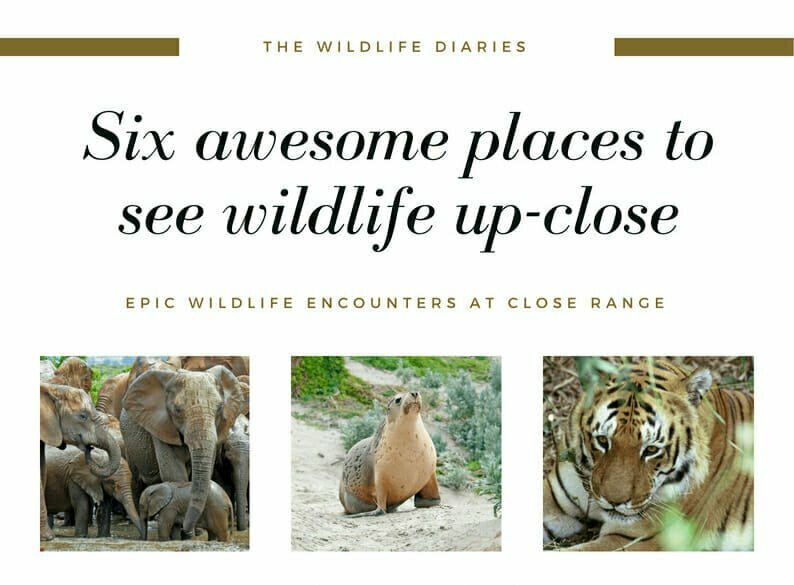 The guide below covers all 7 continents and represents 44 personal recommendations from experienced travellers and wildlife watchers. 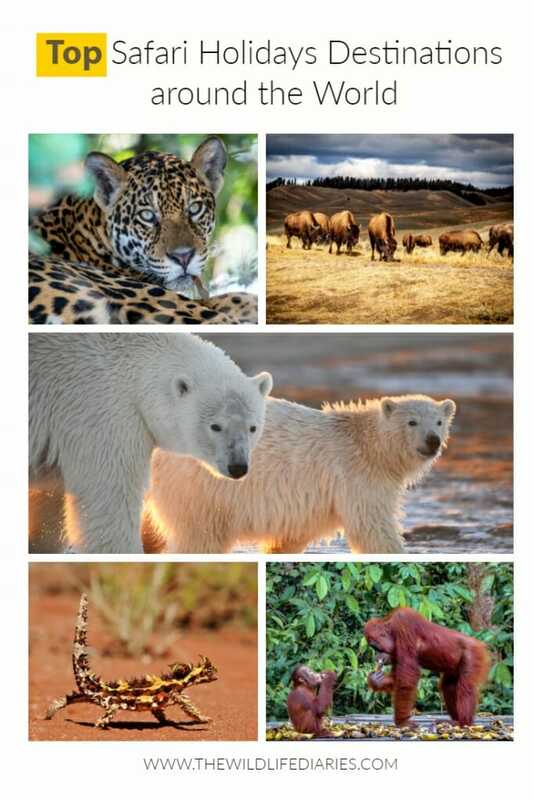 The options range from the iconic experiences like watching Mountains gorillas in Uganda, Polar bears in Canada and Jaguars in the Pantanal to the hidden gems like spotting Clouded leopards in Borneo and seeing the world’s last two Northern White rhinos at Ol Pejeta in Kenya. There is something for everyone here. Whether it’s Africa or Antarctica, budget or luxury, epic or low-key, we’ve got you covered. And before you leave, pick up some safari lingo here, to impress your fellow wildlife watchers. This is Part 1 of the two-part guide. It covers the most highly-recommended safari holidays destinations outside of Africa. Head to Part 2 of this guide for the 19 Top Safari Destinations in Africa and on the surrounding islands. From the snowy Alaskan wilderness to the scorched Mexican deserts, North America is home to hundreds of National Parks that protect such diverse environments as deserts, glaciers, forests, savannah, mountains, fjords and canyons. 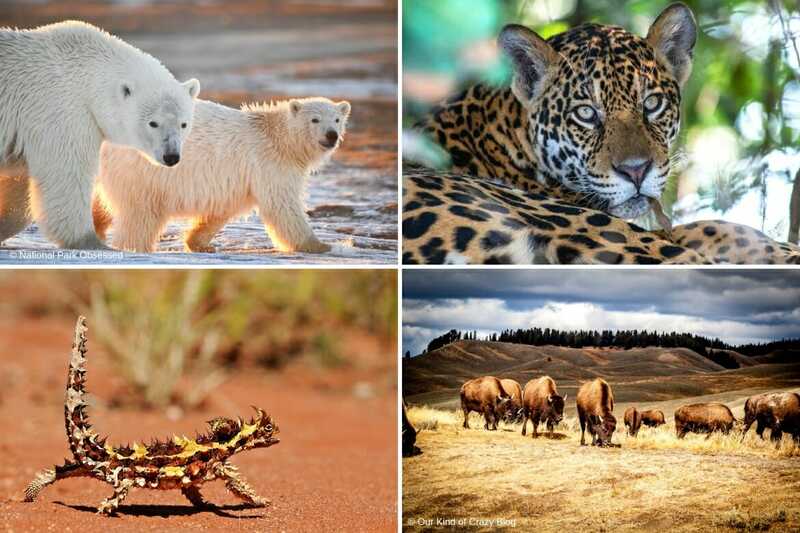 Here are some ideas on where to see the continent’s spectacular wildlife. Kaktovik, Alaska is a remote Alaskan village along the Beaufort Sea. The village is remote and is not connected to the road system. The village sits on the northern shore of Barter Island. The town is home to about 300 people in a 1 square mile area. Winters are cold and long and summers are short and cold. 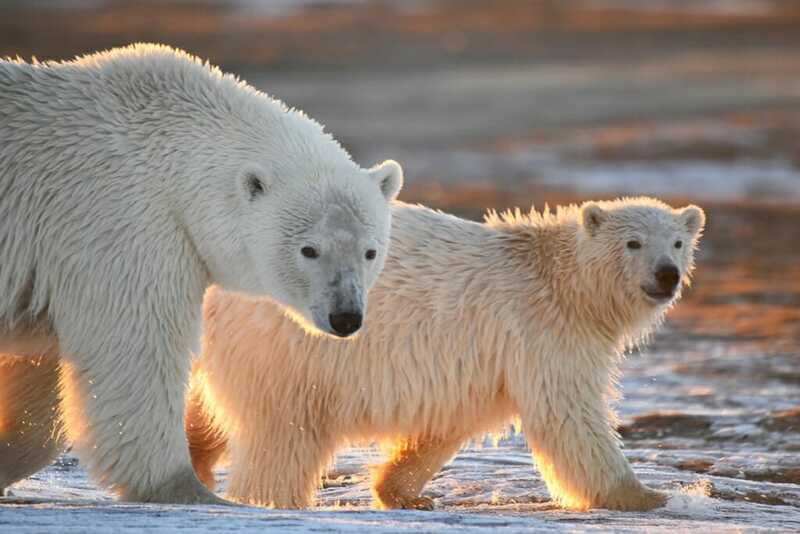 Kaktovik is surrounded by the Arctic NationalWildlife Refuge and is the best place in the United States to see polar bears. In the late fall, young male polar bears and females with cubs gather on the islands along the Beaufort Sea to await the sea ice. The only wildlife in the area are the polar bears and foxes. By the time, the polar bears start to gather, the migratory birds have all headed south but sightings of Snowy Owls have been reported. From mid-August to early October, Kaktovik turns into a safari holidays destination. Over 2,000 people visit every year to take a polar bear safari. Kaktovik’s safaris offer a unique view of the bears. Most of the polar bear viewing is done via small boats. And all tours are done in small groups. The boat minimizes human impact on the bears and U.S. Fish and Wildlife Service carefully monitors all bear viewing. The boats allow visitors to see the bears on these offshore islands while staying a safe distance from the bears. When most people think of safari holidays, they tend to think of faraway lands, and not necessarily their own backyard. But we actually have an awesome place for a safari here in the states. Yellowstone National Park is a great National Park full of wildlife. It is located in 3 different states in the US; Montana, Wyoming, and Idaho. Yellowstone is best explored in your personal car, but there are several areas you can hike as well. You can see wildlife the moment you enter the National Park. During your sightseeing adventures, you’ll be able to spot elk, bison, mountain goats, grey wolf, bighorn sheep, mountain lions, and so many more mountain animals. Our favorite by far though was the grizzly bears! It is such an amazing sight to see grizzly bears in their natural habitat. We were lucky enough to catch a mama bear with her two cubs enjoying a walk around the valley. It was such an exciting experience. You can also see black bears around Yellowstone as well. If you’re looking for a great wildlife experience, you’ll want to add Yellowstone National Park to your list! Be sure to bring your binoculars or spotting scope to be sure you can catch all the amazing wildlife wandering around. Mount Rainier National Park, located in Washington State, United States, is not only a beautiful hiking country but a spectacular place to encounter Washington wildlife. The park has numerous trails ranging from easy day hikes to more difficult multi-day hikes up Mount Rainier. These hikes offer a visitor beautiful scenery, a challenge if wanted, but most importantly the opportunity to see wildlife. Mount Rainier National Park has a variety of wildlife. Ranging from smaller critter such as chipmunks, marmots, and ground squirrels which you are guaranteed to spot on a trip to Mount Rainier. To larger wildlife such as deer and coyotes. The most popular wildlife to spot is the cascade red fox. This fox can be spotted from the northern visitor area Paradise to the lower campgrounds. 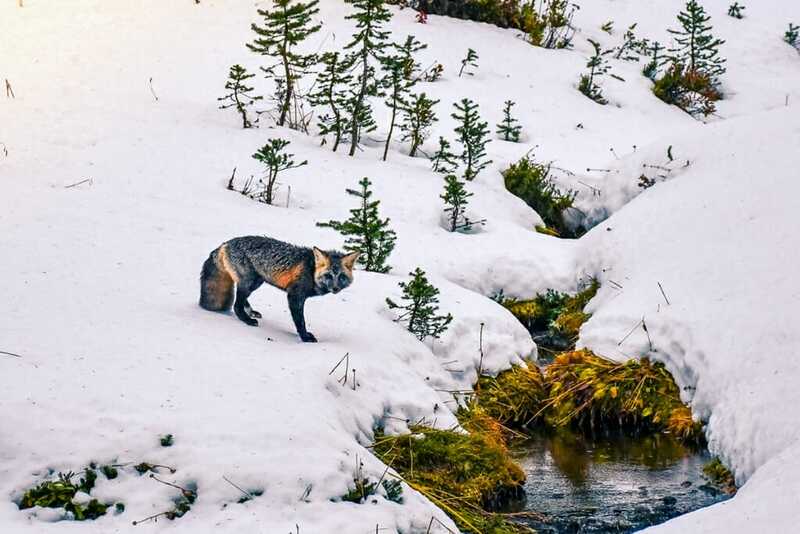 The fox earned the name as some have a reddish tint to the fur, but a majority that can be spotted around Rainier National park will be of a gray color. If you want to increase your odds of seeing one of the cascade red foxes then plan your hike early in the morning before there are too many people on the trails. Additionally, there is a chance to encounter some of the bigger wildlife such as a black bear or a mountain lion (puma, cougar). The mountain lions are nocturnal, so the opportunity to see one is very small. Additionally, the black bears are skittish and tend to stay away from people at Mount Rainier. Due to the habits of these two larger animals, there have been no reported attacks at Mount Rainier. Last year, I went on a very unique safari in Churchill, Manitoba. This tiny town on the edge of the Hudson Bay in Canada’s sub-Arctic north is world-famous for one thing in particular: its resident polar bears. Because the Hudson Bay near Churchill is the first part of the 475,000 square-mile Bay to freeze each autumn, it’s also where the Western Hudson Bay subpopulation of polar bears – upwards of 1000 of them – tends to congregate each October. Here they wait patiently for the Bay to freeze so they can go out to hunt seals after a long summer of not eating anything. And an entire tourism industry has built up around these bears. Churchill is fairly accessible as far as polar bear habitats go. You can get there by plane or train, and several companies now offer polar bear viewing tours. The tours take you out into the protected Churchill Wildlife Management Area in specially-built tundra vehicles (they look like fat school buses with monster truck tires), and allow you to (safely!) get quite close to the wild polar bears. 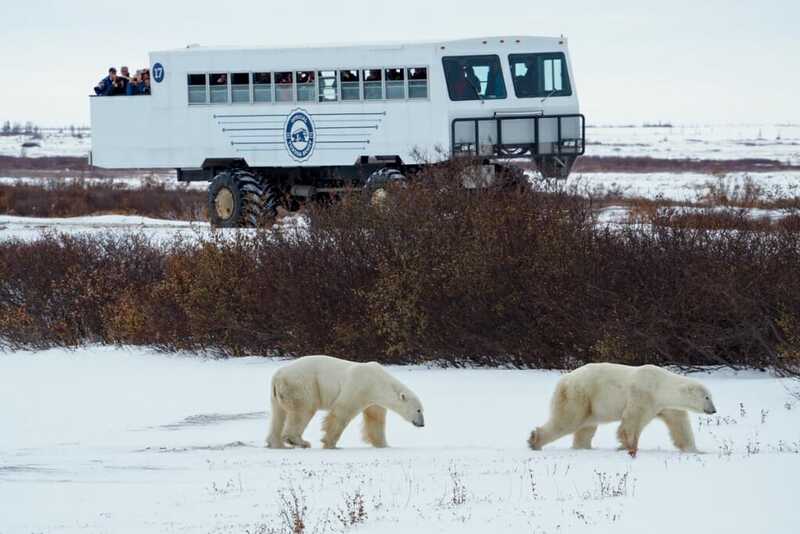 While the Churchill polar bears are undeniably habituated to seeing these tundra vehicles each autumn, they’re not afraid of them at all (polar bears aren’t afraid of much! ), and the tour operators adhere to strict rules in order to ensure that the bears are protected and that the industry is as sustainable and responsible as possible. 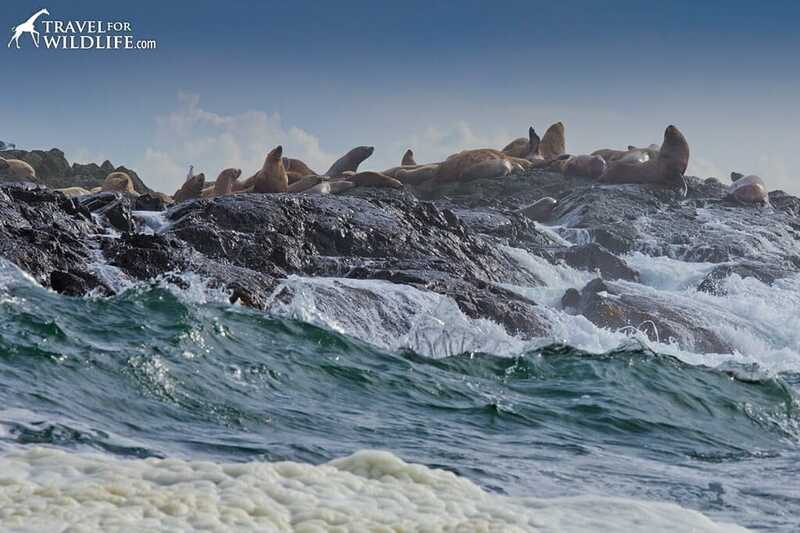 Tofino may be just a tiny town on the southern coast of Vancouver Island in British Columbia, but it provides a truly rare experience in the world of wildlife watching: easy access to a convergence of North Americas greatest predators from the land and the sea. A drive through the Pacific Rim National Park Reserve next door can yield sightings of elusive wolves, mountain lions, and black bears in lush rainforest setting, while a convenient boat tour from the harbor in town can get you up close and personal with orcas, gray whales, and humpback whales. In fact, boat tours are also the best way to catch a glimpse of a back bear feeding on mussels along the coast. Other likely sights include bald eagles, raucous colonies of steller sea lions, quiet harbor seals, tiny harbor porpoises, and the adorable sea otter. A stroll along the beautiful rocky coastline is a great way to observe the rich marine life of the tidal pools including brilliantly colored starfish and anemones. If you want to catch a glimpse of life under the waves then visit the nearby Ucluelet Aquarium where all the specimens are released back into the ocean at the end of each season! Alaska has its own big 5, scratch that we have a big 10 and counting. That means Alaska is one of the top destinations for wildlife-watching and you can see big powerful animals in their truly wild habitat. If you are looking to see 5 of our biggest animals, brown bear, moose, wolf, caribou, and Dall sheep, then you will want to book a Tundra Wilderness Tour into Denali National Park. This tour is conducted in a bus by Park Rangers. To reduce emissions and traffic in the park this is the only way you are allowed to enter the park unless you are on your own two feet. During this 6-8-hour bus tour, you will see animals in a preserved untouched wilderness from a safe non-invasive distance. 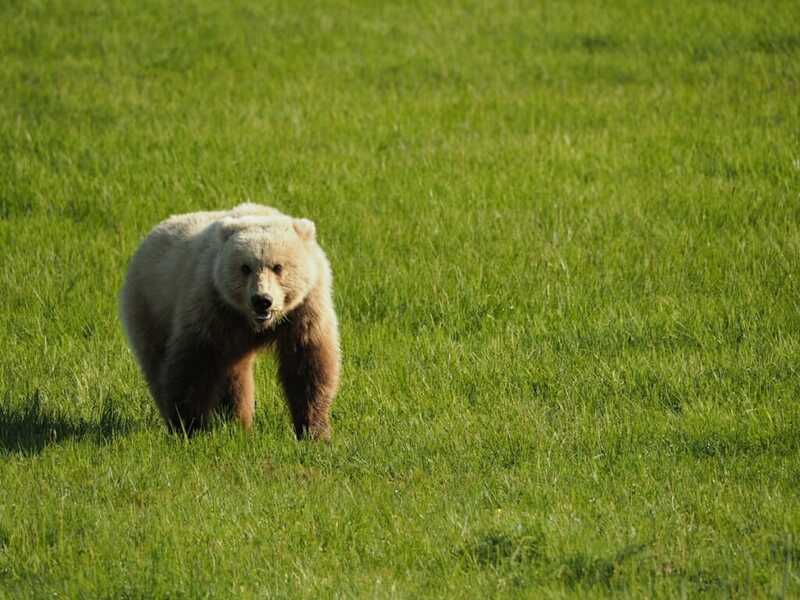 If you want to get up close and personal with one of Alaska’s biggest 5 the brown bear, then you can book a flightseeing excursion departing from Alaska’s largest city, Anchorage to Katmai or Lake Clark National Park through Rust’s Flying Service. This is an easy day trip from Anchorage in a small 6-12 person plane. The plane lands in a remote part of Alaska where you then walk or take a 4×4 to observe and watch the bears in their natural habitat from a safe distance. Depending on the time of year you can see the bears feasting on salmon in Katmai, or feeding on salt marsh grass just after they wake from hibernation. You can even book extended photography trips or stay overnight in a cabin. There are many National Parks in the USA, such as Yellowstone and Glacier, that are famous for their wildlife viewing. One park that’s underrated and much less visited is the Theodore Roosevelt National Park in North Dakota. This park is split geographically in two – the two areas are named the North and South Units. The main geological features of Theodore Roosevelt National park include a large canyon, overlooks, rock formations, and so-called “badlands”. Both units have unique features, but I prefer the North Unit as it has fewer visitors. 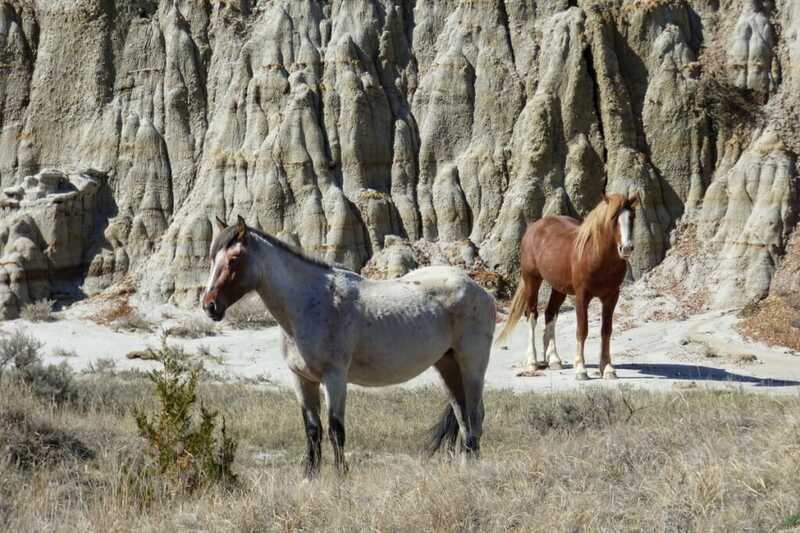 There are many types of animals that live in the badlands. 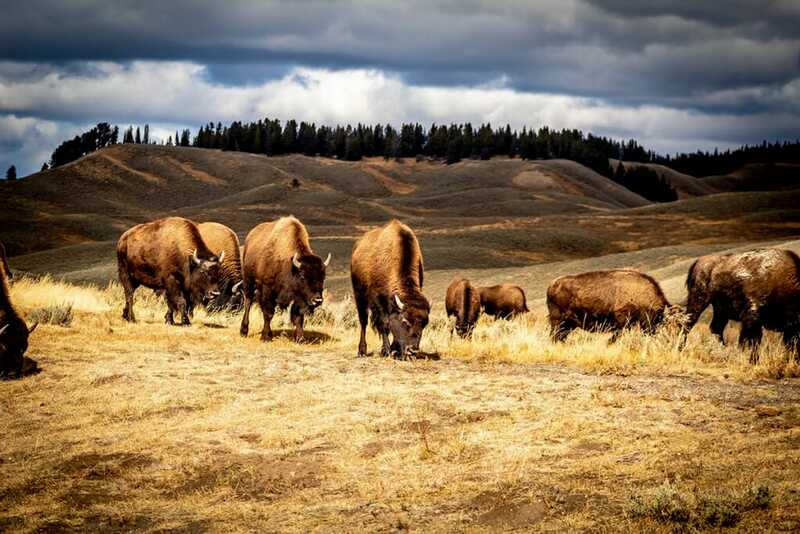 These animals include Bison (American Buffalo), wild Horses, Prairie Dogs, Coyotes, Deer, Antelope, and Bighorn Sheep. Among the bird varieties you might see, there are Burrowing Owls, Meadowlarks, and Sharp-Tailed Grouse. If you visit in the spring, you can witness the unusual mating dance of the Grouse. There’s no need for a tour here – you only need a car and hiking boots to view the multitudes of animals. The roads are paved and in good shape. There’s no need for a 4×4 or SUV, any car will suffice. Both units of the park contain campgrounds and it’s quite common for wildlife to visit in the evening and morning. Everglades National Park isn’t usually the first that comes to mind when you think of wildlife, but you would be surprised at everything you can see there. While it may not all be native, like the pythons, that doesn’t mean they aren’t exciting to see. The best time to visit Everglades National Park will be January to March since humidity is a lot lower, but it’s also the busiest and most expensive time to visit, so make sure you plan ahead for hotels. 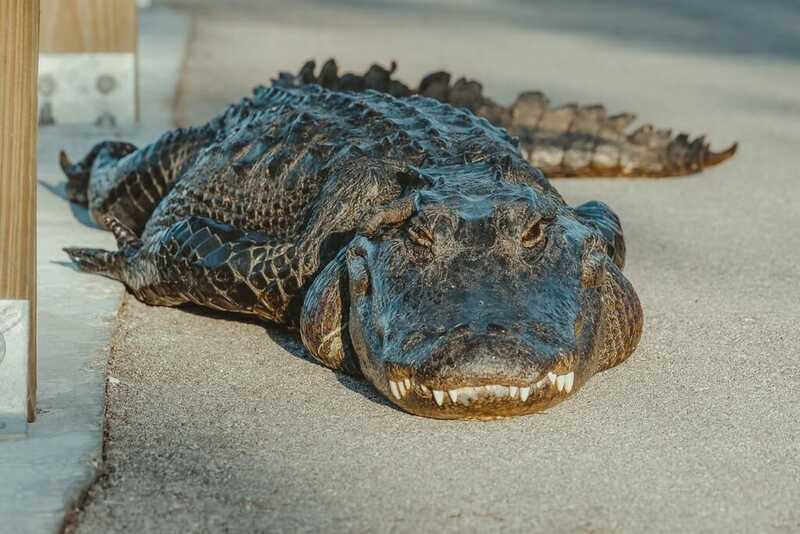 Some of the wildlife you can see in the park includes alligators (of course,) American crocodiles, manatees, pythons, possible a Florida panther, and tons of birds. The best, and most easily accessed place to look for wildlife is the Anhinga Trail, a 0.8-mile boardwalk. It’s a few miles after the park entrance near Florida City. If you want a better chance to see a crocodile is near the Flamingo Visitor Center. You’ll have the most luck on a boat tour from that area. Winter is the best time for bird watching, too. 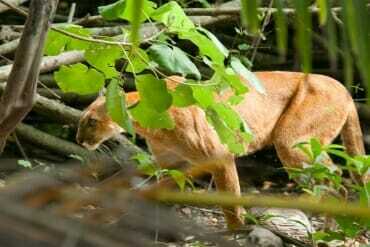 If you are trying to spot the elusive Florida Panther, your best bet will be to venture over to the west side of the park near Big Cypress National Preserve and Fackahatchee Strand State Park. And if you’re really lucky, maybe you’ll even spot the Everglades version of Bigfoot, the Skunk Ape. 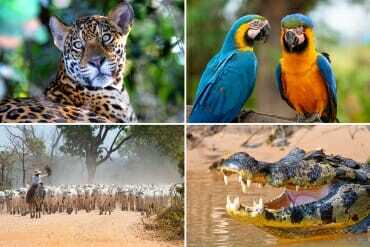 Home to five out of 10 most biodiverse countries in the world, including Brazil – the world’s most biodiverse country, Latin America is the richest ecological region on our planet. With more wildlife watching destinations opening up each year it is, by far, one of the best places in the world for wildlife safari holidays. Brazil’s Pantanal may not be as famous as the Amazon, but it’s actually the best place in the country for wildlife viewing. While the animals of the Amazon tend to hide in the jungle, the Pantanal wetlands are full of wide-open spaces, making it much easier to view the native birds and mammals. It’s a birder’s paradise, and you can expect to see blue hyacinth macaws, toucans, jabiru storks and dozens of other species. The mammals that live in the Pantanal include capybaras, peccaries, giant otters, armadillos, and anteaters, among others. 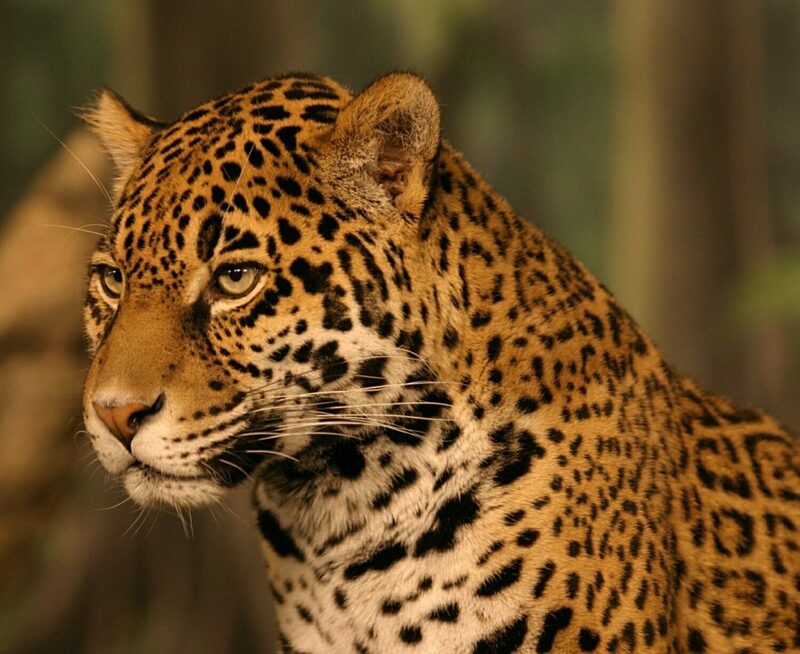 The most famous local resident is the jaguar, and the northern Pantanal is the best place to see them. The Pantanal ecosystem is under threat from cattle farming, and most of the accommodation available to tourists is on farm stays. This could ultimately be a positive thing if the farmers see that they can make money from tourism rather than from raising animals. It’s a complicated ethical issue that merits consideration before your trip. To minimize your ecological impact, do not feed wild animals, and of course don’t kill any animals either, including fish. Sadly, piranha fishing is common on many farm stays, but you can swap this out for another activity. Boat trips along the Pantanal’s many rivers are the most common form of safari, and this is where you’ll see the most wildlife. Jeep tours and walking tours are also offered by most farm stays, but sightings on these can be hit or miss. Lying 240 km from Campo Grande, the capital of Brazil’s state of Mato Grosso do Sul, Fazenda San Francisco is home to an incredible abundance of wildlife. 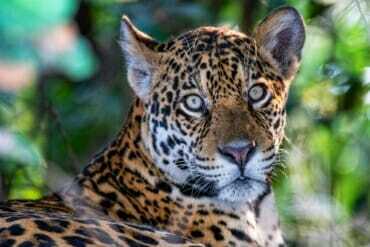 This property, part a working farm, part an eco-lodge lies on the southern fringes of the Pantanal, about 600km south of Porto Jofre, the jaguar watching capital of the world. 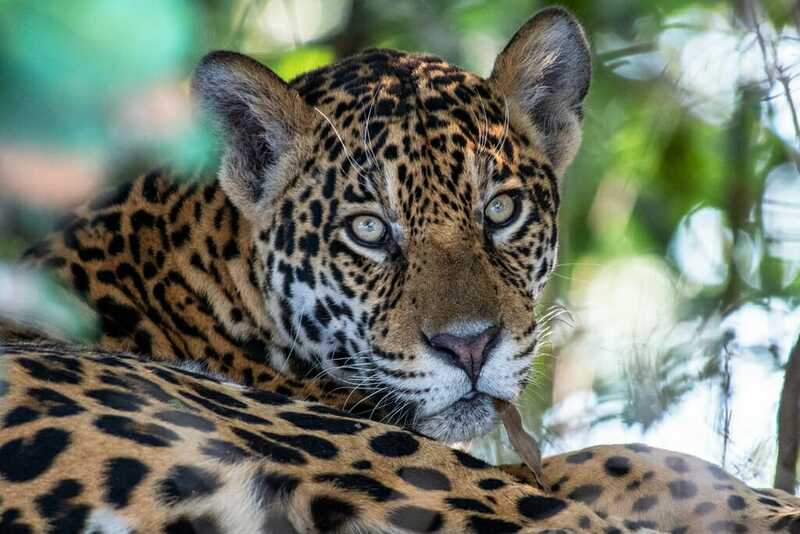 While jaguars are not quite as easy to spot on your safari holiday at fazenda San Francisco, it is probably the best place in Brazil to see the giant anteater and the ocelot. The Fazenda offers daytime and nighttime safari drives as well as plenty of other nature experiences. The birdlife at the Fazenda is nothing short of spectacular. Blue and yellow Macaws, toco toucans, blue-fronted parrots and nanday parakeets congregate in huge flicks around the bird feeders – the biggest I’ve ever seen. Out in the fields, you can spot the most adorable little owl – the burrowing owl. These comical birds usually win all the Comedy Wildlife Photography competitions. Mainly because they like to stand up tall, on one leg, with their heads turned at 90 degrees to their bodies. Other wildlife you are likely to spot here is grey foxes, marsh deer, caiman, yellow armadillo, and possibly puma, jaguar and even a Maned wolf! Paraty is an unexpected wildlife watching destination. We came for the beach and the colonial town centre, but once we saw the lush jungle carpeting the mountains that surround the town, we knew we had to explore further. This jungle is one of the last remaining tracts of Atlantic forest in Brazil. The best way to explore the mountains around Paraty is on a birding tour with Gabriel from Paraty Birding. In just five hours with Gabriel, we saw over 100 species, at least half of them were new to us, even though we already spent three weeks in Brazil. The tour started in the coastal mudflats near the town’s main pier, then went to the surrounding countryside and finally into the mountains, where we saw the most spectacular birds. There is a cafe on the side of the mountain, about 30 minutes out of Paraty and it is a fantastic birdwatching spot. 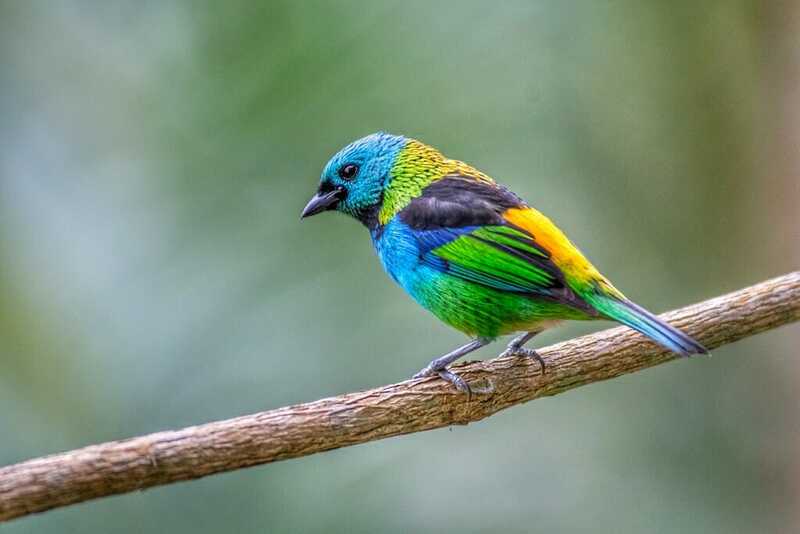 We saw the brilliantly-colored Green-headed tanagers, Red-necked tanagers, Brazilian tanagers, Gold-shevroned tanager, Blue dacnis is a plethora of other, less striking species. Yet Paraty is not all about birds of course. There are White-eared marmosets in town, and the crystal-blue waters of Paraty Bay are home to Bottlenose dolphins. In fact, if there is one ‘must-do’ thing to do in Paraty is the Mamangua fjord cruise – the only tropical fjord on Brazil’s coastline. The Galapagos Islands are situated in the Pacific Ocean, approximately 1000km from the South American continent, and usually accessed from Ecuador. These nineteen islands are located at the confluence of three ocean currents and are a ‘melting pot’ of marine species. The extreme isolation of these islands has led to the development of unusual animal life; the land iguana, the giant tortoise, and the many types of finch, that inspired Charles Darwin’s theory of evolution. The Galapagos Islands can be accessed via cruise boat or a land-based stay. We opted for the later and spent almost two weeks on the four islands of Floreana, Isabela, Santa Cruz and San Cristobal. The wildlife on the Galapagos Islands is exceptional and you’ll likely see sea lions, penguins, giant tortoises, land iguanas, pelicans, blue-footed boobies, sharks, rays and turtles, on any visit to the islands. Any trip to the islands should contain both land-based and sea activities. We explored on foot, bike, kayak and boat during our time in the Galapagos. These islands are an absolute bucket list safari destination and one not to be missed. 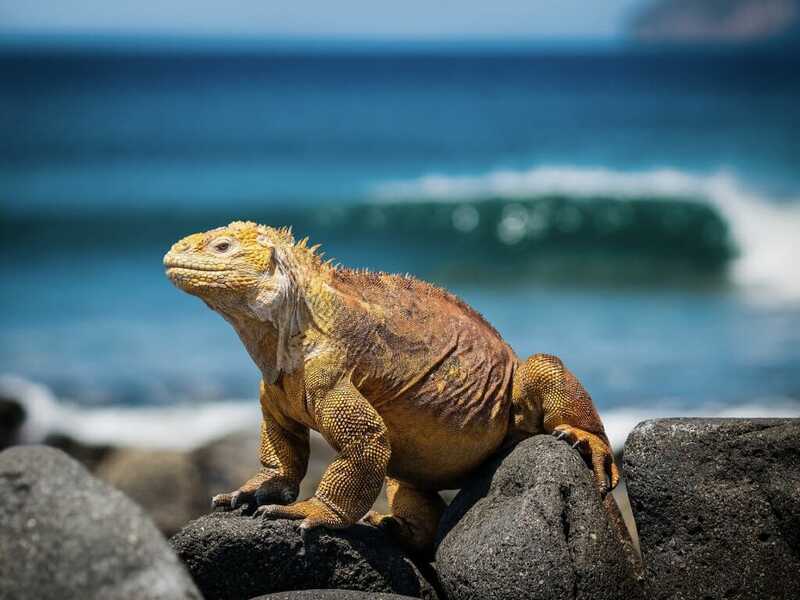 The Galapagos Islands are home to some of the highest levels of endemism anywhere on the planet, meaning that many of the plant and animal species can only be found in that area. A definite once in a lifetime experience. 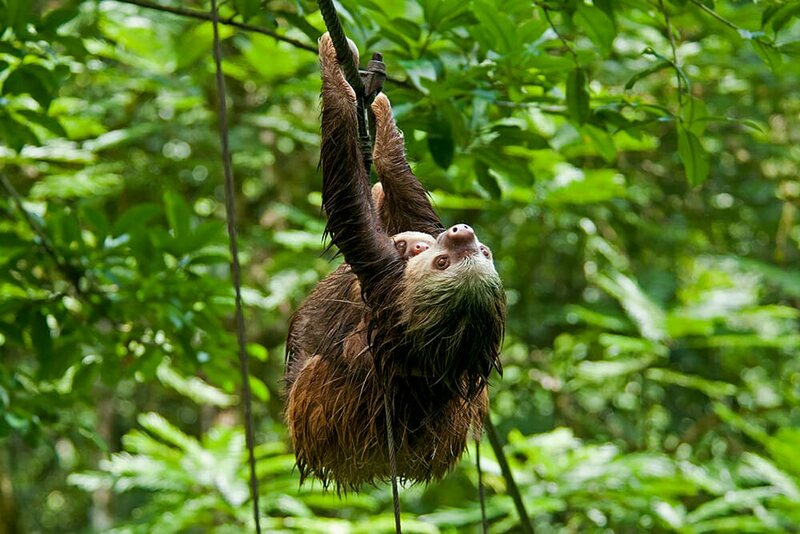 Costa Rica is a wildlife watcher’s paradise. From pumas and jaguars to tapirs and sloths, to toucans and dart frogs, Costa Rican wildlife is as abundant as it is diverse. Wherever you are in Costa Rica, you will see some wildlife. But to see the highest diversity of species and to explore the pristine jungle, head to Corcovado National Park. National Geographic referred to Corcovado as ‘the most biologically intense place on earth in terms of biodiversity’. 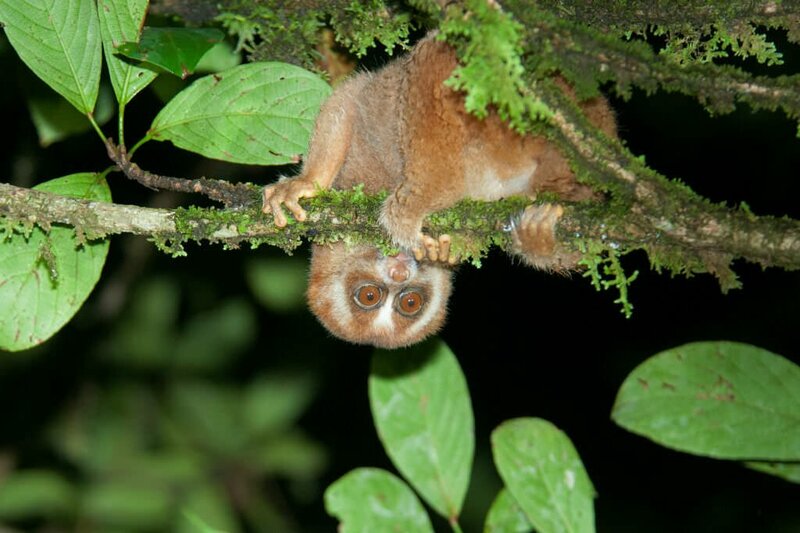 Taking up almost a third of the remote Osa Peninsula, it is home to 140 species of mammals, 375 species of birds and 116 species of amphibians and reptiles. Many of these animals are quite easy to spot in the park. Getting to Corcovado requires some effort. You can either make your way to the small coastal town of Drake Bay and reach the park by a 2-hr boat ride, or you can take an all-day hike from Puerto Jimenez to Sirena Ranger Station. Sirena is the best place to base yourself in Corcovado, as it is surrounded by a network of jungle trails. Corcovado is a truly wild and remote wilderness and as such, it can only be visited on an organized tour with a certified nature guide. You will need to bring most of your food and water with you for your stay at Sirena Ranger Station. Tirimbina Biological Reserve is a little gem we discovered on the road trip across Costa Rica’s National Parks. Tucked away in the mountains about 2-hour drive from San Jose, Tirimbina is both, a private nature reserve and a biological research station. Only about a third of Tirimbina Reserve is open for eco-tourism, the rest of the area provides undisturbed habitat for a great variety of wildlife. The money raised from eco-tourism is used to fund wildlife research in the Reserve. Famously, Tirimbina is home to Costa Rica’s longest suspension bridge, as well as a shorter canopy bridge. These bridges present good wildlife watching opportunities. We saw Hoffman’s two-toed sloths and Northern raccoons on the bridges. The canopy bridge is also the perfect spot for spotting birds. Spend half an hour there early in the morning and you’ll see dozens of different canopy species at eye level. The lodge grounds, on the other hand, are good for spotting large birds, like Keel-billed toucans, Collared aracaris and Black-mandibled toucans. Another cool creature that is easy to see at the lodge is the Strawberry poison-dart frog. I didn’t realize how tiny these guys are – about the size of my thumbnail. The lodge offers a few options for guided wildlife tours, including a night walk, a bat walk and guided day walks. I would highly recommend taking at least one night walk to see a range of nocturnal species. I’d lived in Argentina for years without ever considering it a wildlife destination. Wine, hiking and tango? Obviously, but safari? That changed after spending four days on the Peninsula Valdes in Patagonia. The most popular wildlife sighting here is the southern right whale that breed here every year. There are excellent boat excursions departing from the town of Puerto Piramides to whale watch from the water. But if you’re on a budget, the beach at Playa Doradillo has a sharp and steep drop off. This creates very deep waters just meters from the shore allowing you to whale watch comfortably from the beach. The whales swimming only 20 meters away. Whales aren’t the only animals that have chosen the Peninsula Valdes to breed. 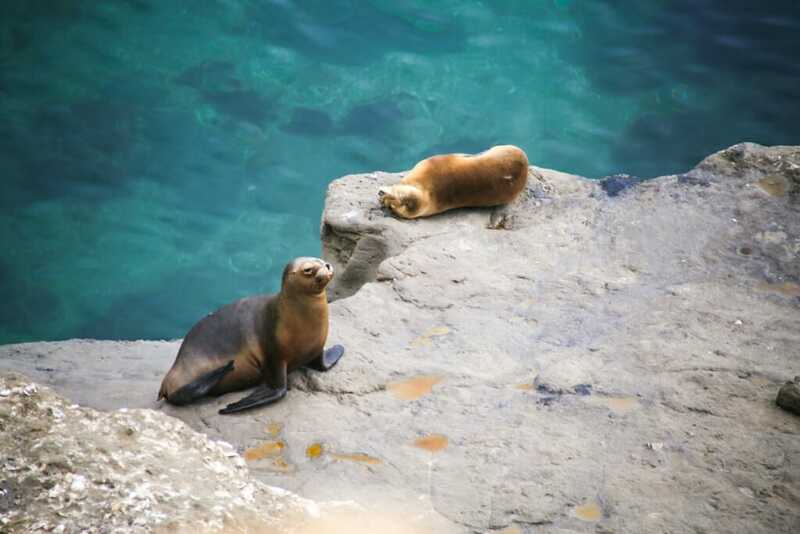 Sea lions and elephant seals both return here each year to have their pups. Orcas are drawn to the waters to hunt the seal pups and are best seen from Punta Norte. Boardwalks, paths and viewpoints are set up at a safe distance at each animal colony. They’ve been planned so that the animals never feel any distress and humans are always at a safe distance (so pack that zoom lens!). It’s best to rent a car to explore at your own pace, but there are plenty of guided tours from Puerto Madryn if you’d rather not drive. While driving across the peninsula keep your eyes peeled for guanacos (cousins to the llama), choiques (similar to an ostrich), hares, furry armadillos and more. Ushuaia, the city at the end of the world, the last city at the end of the Argentinian Patagonia. In Patagonia, nature is king and you can see a variety of animals in the wild. There are tours that will take you to see cormorants or sea lions, however, the most interesting wildlife that you can see are Penguins! In fact, there is a tour that will take you walking with them in their natural habitat! Piratour is the only company that will take you on the island. In order to preserve the habitat and the animals, Piratour only offers two trips per day and limits the number of passengers per trip to a maximum of twenty. The penguin colony is located in Isla Martillo, a small island in the Beagle Canal. To arrive at the island, you take a small speed boat. While on the boat, there will be a high probability that you will also see whales swimming next to you. 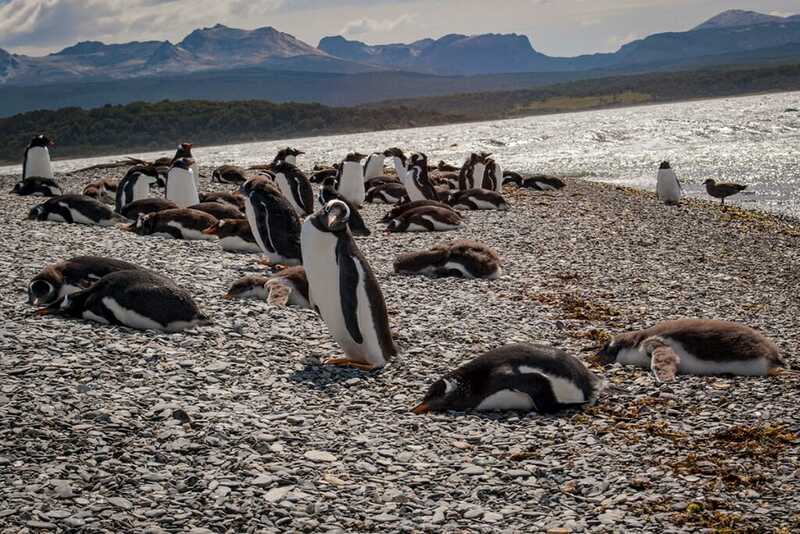 On the island, you will be able to see Magellanic and Gentoo penguins. 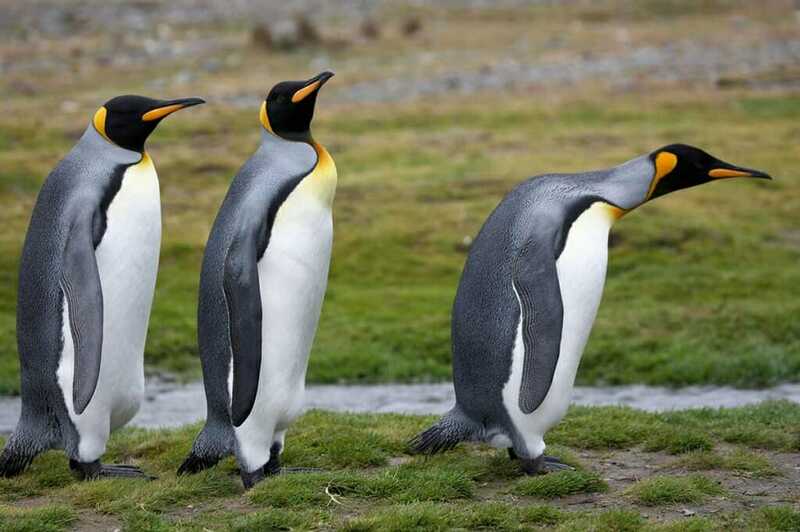 On very rare occasions, you will be able to see King penguins. You are on the island for around 1 hour. The guide reminds you of the rules, do NOT touch the penguins, leave at least 3 meters distance between you and the animals and do not feed them, do not take anything from the island and do not pollute. You cannot go wander around the island, you are asked to stay within the permitted perimeter. 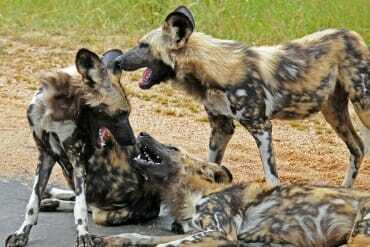 These are wild animals and you are intruding into their territory so be mindful of them! 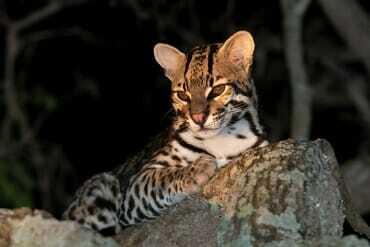 Lying 370 kilometres from Buenos Aires, El Palmar is a good place to see one of South America’s small spotted cats – the Geoffroy’s cat. Only here, the cats are often black, due to a genetic condition known as melanism. 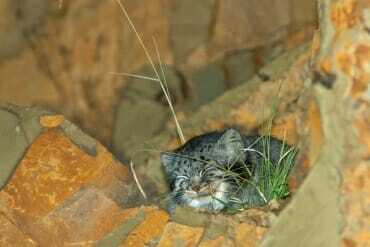 It took us three days to track down the cat, but we found one in the end, in the bushes near the campsite. While searching for the elusive feline we spotted quite a variety of wildlife. 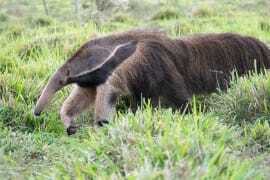 Grey foxes, hog-nosed skunks, plains vizcachas and capybaras were the most common mammals in El Palmar. The birds are of course much easier to see. Roadside hawks and American kestrels perched on the soggy branches, vividly-coloured Southern lapwings and Whistling herons waded across the flooded lawns, woodpeckers and tanagers kept busy in the trees, while massive Rheas strutted across the grassland. The park’s restaurant turned out to be a good spot for birdwatching. Plush-crested jays, monk parakeets and a few species of tanagers are all very common. We even found a roosting Great horned owl when it started calling from deep inside the crown of a tall tree. El Palmar is also home to the last remaining groves of Yatay palms in Argentina. These towering shaggy giants give the park an exotic appearance. From the snow-covered peaks of the Himalayas to the steamy jungle of Borneo, Asia is home to some of the most biodiverse spots on the planet. Here are the top wildlife watching destinations you can visit on your next safari holidays in Asia. 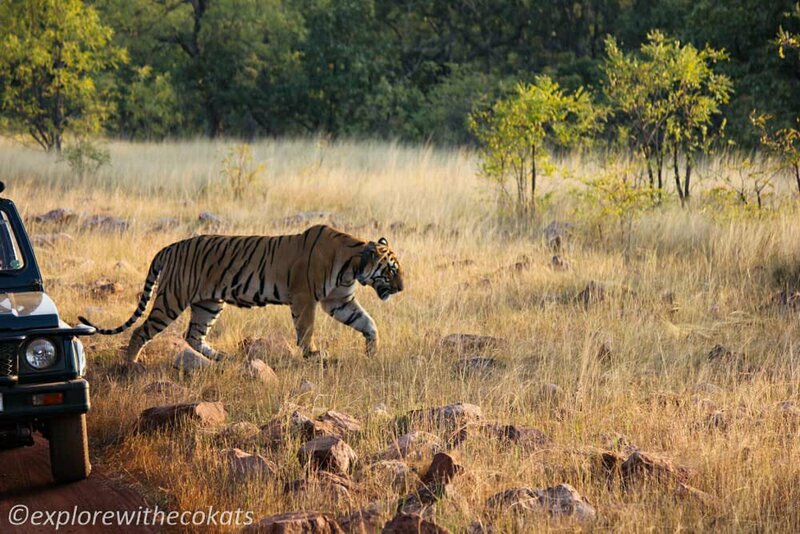 Seeing tigers in the wild in India is always a thrilling experience, and I’ve been very lucky. Every time I have gone on safari in Kanha National Park and Tiger Reserve in Madhya Pradesh, I have seen a tiger. In fact, Kanha is considered one of the best places to spot a tiger in India. The tigers of Kanha are very well known to wildlife lovers in India. There’s even a book dedicated to them. And the most legendary tiger in India, Munna, is the grand old man of Kanha. But the wonderful thing about Kanha is that it doesn’t actually matter whether you see a tiger there or not. The park is so beautiful and so abundant in birds and wildlife, flora and fauna, that you will be mesmerized by everything else that you see while on safari. 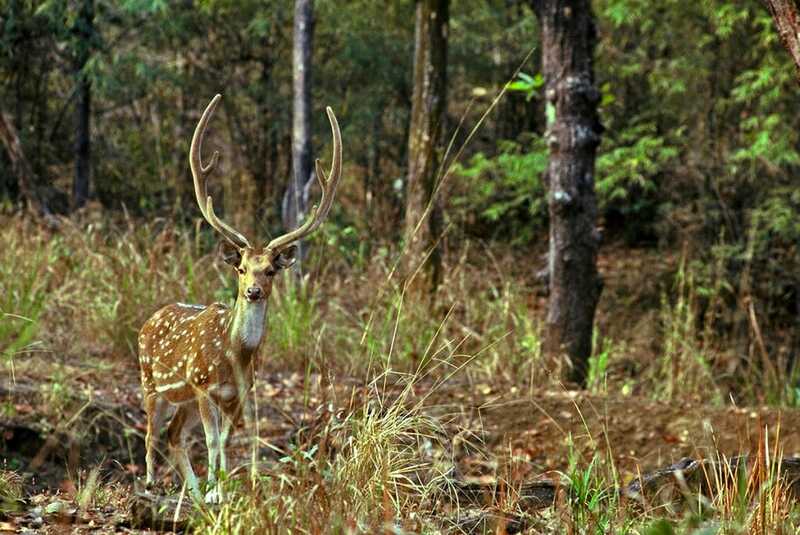 Barasingha hard ground swamp deer can be seen in plentiful herds in Kanha – there are about 700 in the park. A captive breeding program at Kanha saved them from the brink of extinction. You can also see sloth bears, dhole, wild boar, gaur, leopards, golden jackals, spotted deer, sambar deer, langurs, as well as hundreds of bird species. When you hear the term “Big Five”, thoughts of African safaris probably come to mind. But did you know Kaziranga National Park in India has its own Big Five? Located in the northeastern state of Assam, blanketed by a variety of landscapes, and watered by four different rivers, Kaziranga is home to one-horned rhinoceros, Asian elephants, wild water buffalo, swamp deer, and the majestic (and elusive) Bengal tiger. These Big Five are but a few of the animals you might encounter. In fact, it would be strange if you didn’t see at least a dozen rhinos during your safari! Safaris to Kaziranga can be conducted in several ways. Most people opt for a Jeep ride, but it’s also possible to go by boat on one of the rivers running through the park or explore the park on elephant back. Although travellers should be wary of elephant riding in general, the issue is not as black and white as it may seem in Kaziranga. Elephants working in the park were saved from other endeavours, not captured from the wild. 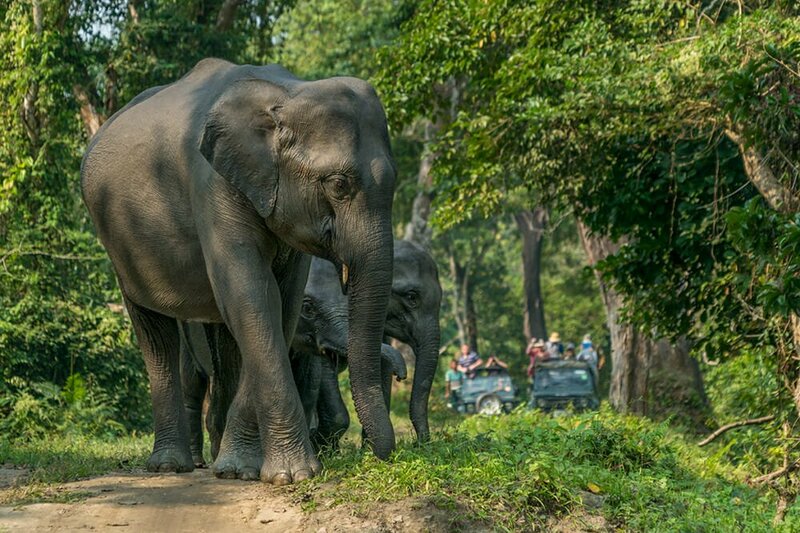 Riding elephants allows visitors to explore the park in-depth while avoiding disturbing wildlife and destroying habitat to build more roads in the park. Kaziranga also limits intrusions in the park by restricting the number of Jeeps that can enter the park each day. As far as ethical safari experiences go in India, Kaziranga is making an excellent effort to do things right. Seeing a tiger in the wild was on my bucket list for ages but we never went to India because of the feared Delhi Belly. But the call of the tigers was too strong so we finally booked a trip to Ranthambhore National Park. We stayed at Oberoi luxury tented camp that offers 2 safaris a day, one very early in the morning and the other one late in the afternoon. The safaris are operated by the government. You get the same guide (but different drivers) for every trip and you are assigned to a different zone of the park for every safari to keep the park from overcrowding. Soon after our arrival, we left for our first safari. After a short drive, we entered the park. And we were lucky! After 30 minutes we spotted our first tiger! We needed binoculars to see it, but we were so excited. Later we saw two cubs that were practicing their hunting technique. During the 3 following safaris, we saw tigers close by. Although the environment in Ranthambhore was not as beautiful as in Africa (we were there in the dry season), a close encounter with a tiger was the most spectacular safari experience we ever had. They are so giant and graceful. I think tigers are the true kings of the jungle. April is the best month to spot tigers as it is the dry season. 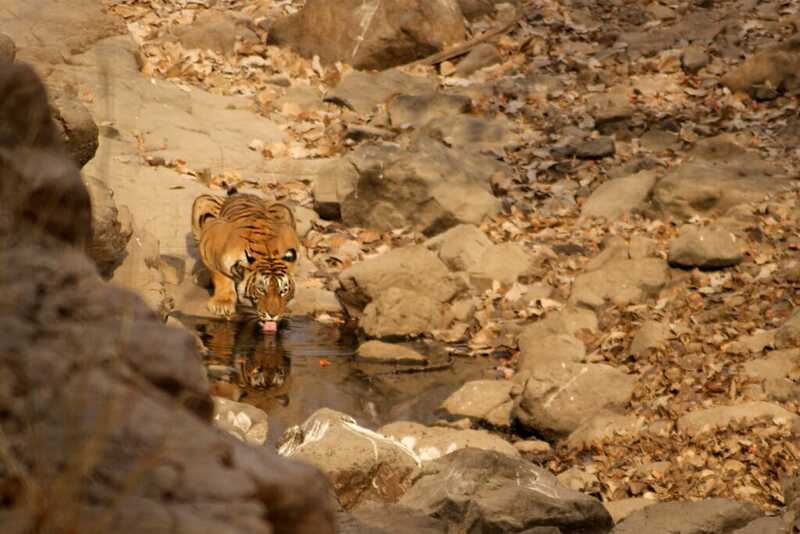 There are 65 tigers in Ranthambhore so we were extremely lucky to spot them on 4 out of 5 trips. Not many travellers are aware of India being a wildlife destination. India has 515 wildlife/animal sanctuaries out of which 166 are declared as National Parks while others are Wildlife Sanctuaries. Out of these 166, 48 national parks are governed by Project Tiger. Tigers were once prevalent across the nation but poaching made them reach to the ‘endangered’ category in the IUCN Red List. Thanks to the efforts by the Indian government, tigers are protected and their population is steadily increasing. Awareness amongst the tourists and strict checking for poaching is also giving rise to ecotourism and ethical wildlife safaris to spot the elusive cat in wild. 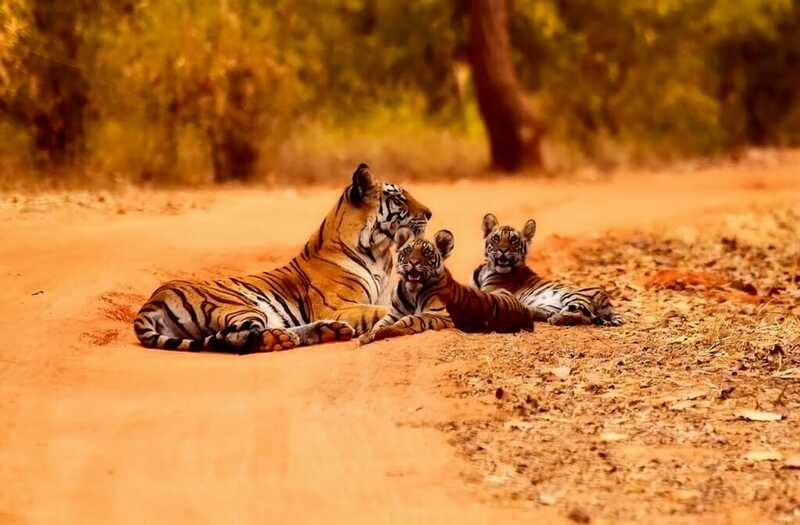 Tadoba Tiger Reserve in the western state of Maharashtra is one of the National Parks which is favourite amongst the tourists and wildlife photographers due to more possibility of spotting the tiger. Tadoba has a population of 40+ tigers and tourists can have a chance to spot them during two safaris per day (6 – 9 am and 3 – 6 pm). The safaris need to be booked online and the booking period begins 4 months in advance. The safaris are to be done in two types of vehicles – canter (accommodates 15-18 people) or an open gypsy (6 people). If you plan to visit any wildlife parks in India, beware that all parks are closed during monsoon – mid-June to Mid October. Nepal is well known for views of the Himalayas and famous hikes, like the trek to Everest Base Camp, but there is much more to this pocket-sized country than mountains. In fact, near the border of India, there is a place that looks totally different than the Nepal you see in pictures and movies. The grassy lowlands of Chitwan National Park are known for their biodiversity and vast array of rare wildlife. This is one of the best places in the world to spot the elusive one-horned rhinoceros. Chitwan is also home to Bengal tigers, sloth bears, elephants, monkeys, crocodiles, and many bird species, including the great hornbill. 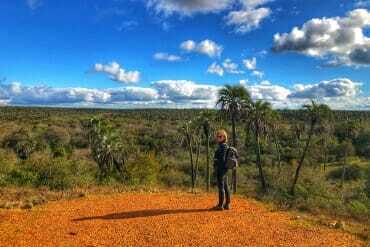 Visitors to this UNESCO site can visit the park on one of several different types of safaris. Explore on foot with an experienced guide, in an open-roof Jeep, in a dugout canoe on the river, or by spending the night in a jungle safari lodge. Pick and choose the type of safari that interests you the most. There are big efforts being made in Chitwan National Park for the conservation of many rare animals, and there are many businesses that give back to the environment and local people. You can support the conservation of rare and vulnerable creatures by visiting this special place. Established in 1936, Jim Corbett Tiger Reserve is spread over an area of 1288 km² located in Hilly region of Uttrakhand state in India. What makes this park special is the honour of being the first national park to be established in mainland Asia. The reserve was named after the British Colonel, tracker and naturalist Edward James Corbett, known for his book “Man-Eaters of Kumaon“ in which he describes his adventure of hunting man-eating tigers in this region. The reserve is home to second largest population of Bengal Tigers in India. It is divided into 4 zones, and you can pick which zone you wish to explore based on the type of wildlife you want to see. 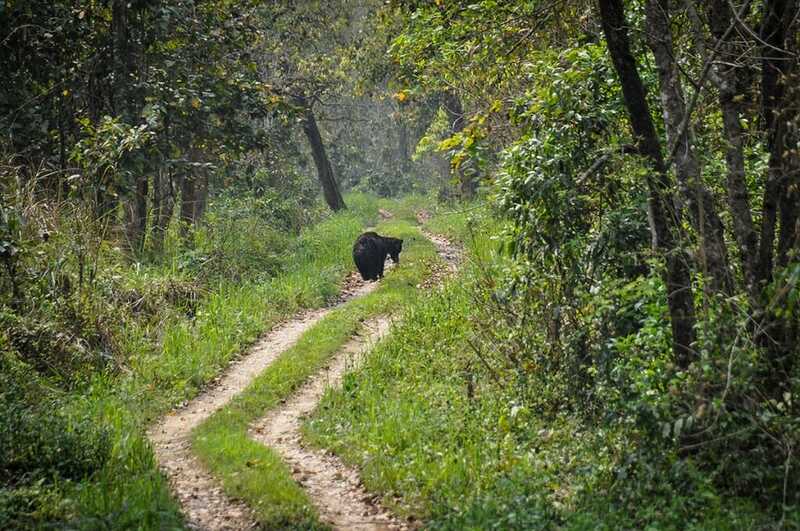 Other than tigers, you can spot Black Bear, Leopard, Chital, Mongoose, Elephants. Safari can be taken either in Open jeep (6 pax) or closed Canter (20 Pax ) and can be booked online on the reserve’s government-managed website. Best time to visit Jim Corbett Tiger Reserve is from November to July. The reserve is closed from July – October for breeding season of the animals. The nearest international airport is Delhi (300 Km) and the nearest train station is Ramnagar (10 Km). Multiple hotels and eco-resorts are located near the park but, as locals, we recommend to book your stay inside the jungle for the best experience in natural surroundings, although with minimal facilities. The Udawalawe National Park in Sri Lanka is one of our favourite safari destinations. It is often considered to be one of the best national parks in Sri Lanka to rival the savannah reserves of Africa. Whilst most people will head to Yala National Park, the latter has become so crowded and busy, that you’ll probably end up seeing more jeeps than wildlife. In contrast, Udawalawe is smaller than Yala but has just as much wildlife, particularly elephants and leopards and fewer people. Udawalawe was established in 1972 as a sanctuary for wild animals displaced by the construction of the Udawalawe Reservoir on the Walawe River. When we went, we saw many elephants, peacocks and crocodiles. The elephants, in particular, you get really close up to them. For us seeing elephants so close in the wild was a highlight. We also got lucky and spotted the park’s resident leopards. Normally leopards are hard to spot because they are elusive, solitary nocturnal mammals, hunting between sunset and sunrise. Also, their hunting behaviour makes them hard to spot as they are used to stalking their prey by being camouflaged and well-hidden before pouncing. The best time to spot them is the late afternoon with a good guide. To give you an idea, Yala has around 40 resident leopards, but due to the overcrowding, it’s quite hard to spot them. By contrast, whilst Udawalawe only has 10 leopards, you’re more likely to spot them here, and have them all to yourself without the jeep traffic. One of the most amazing places for a safari in the world is the Danum Valley in the depths of Borneo. This is one of the few remaining pockets of virgin rainforest in Borneo and is a haven to native wildlife. You can stay at the luxurious Borneo Rainforest Lodge, where guided hikes and a night drive for wildlife viewing are included in the price. There is a canopy walk, and harder treks on muddy paths through the leech-infested jungle (wear leech sock!). It’s totally worth it. This is one of the best places – and one of the very few – in the world to see orangutans in the wild. It is also common to see other monkeys such as macaques. Birds are also common, and the rhinoceros hornbill with its huge rainbow-colored bill is a treat. In addition to several orangutans, other animals I saw include a giant red flying squirrel (it leapt from one tree and glided through the air at least 100 meters to another tree – an incredible sight! ), a colugo, flying frogs (lots of things fly! 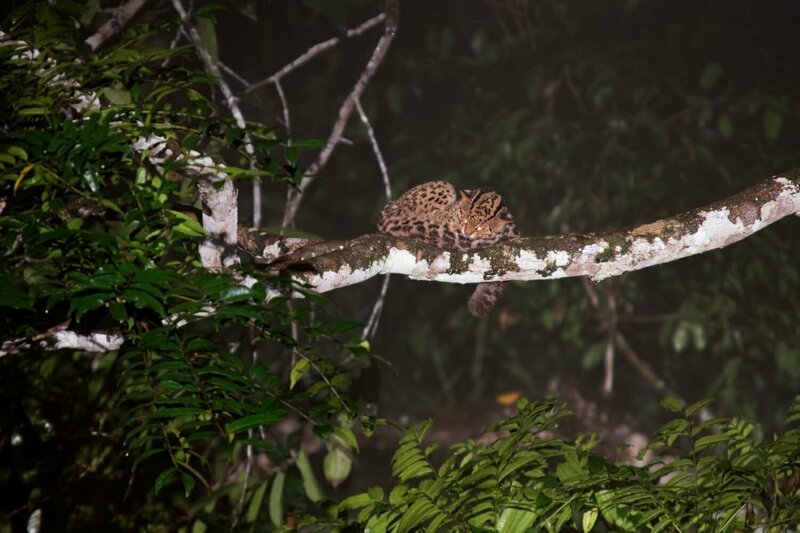 ), an extremely rare clouded leopard, and a huge monitor lizard. This was some of the best wildlife viewing I’ve ever done. Not widely known outside of the dedicated wildlife watching circles, Deramakot Forest Reserve is the best destination for spotting the rarer species of Borneo wildlife. 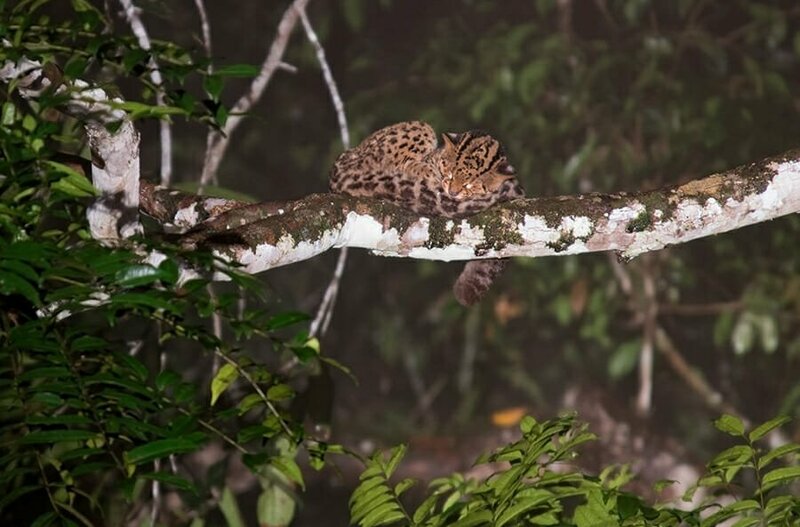 I travelled to Deramakot in search of Borneo’s wild cats, specifically the elusive Sunda Clouded leopard. And even though it took me two trips, I spotted the secretive cat. But there is, of course, so much more to Deramakot than the Clouded leopard. There are of course the iconic species, Borneo orangutan and Borneo Pygmy elephant, both are not difficult to spot. 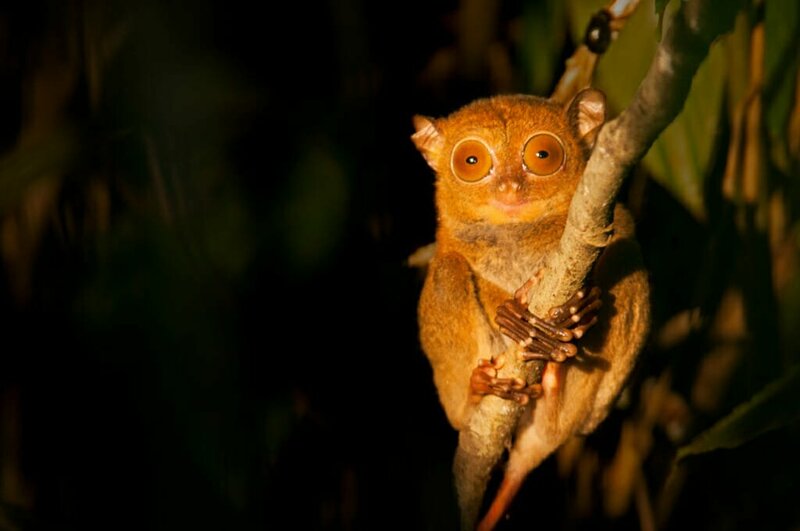 Colugo, Philippine slow loris, Sunda leopard cat, flying squirrels, Common and Malay civets are all common on night drives. And then there are the rarities like Otter civets, Marbled cats, Binturongs, Banded palm civets even Sun-bears. The diversity of wildlife in Deramakot is not limited to mammals either. 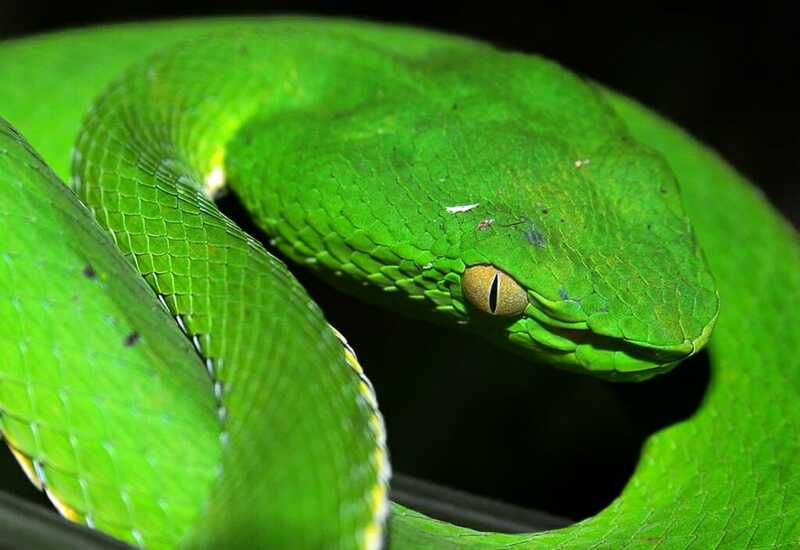 Borneo has an incredible variety of flying or rather gliding reptiles and amphibians. The coolest of them is Wallace’s flying frog – a large beautiful frog with bright gliding membrane stretching between its toes. There are also gliding lizards and gliding snakes! Kinabatangan River is the longest river in Sabah and is home to the most varied and easily accessible wildlife in all of South East Asia. One of the world’s most diverse ecosystems and a renowned wildlife sanctuary makes it the perfect place to seek out rare and exotic species that are endemic to Borneo. This includes Orangutans, Proboscis monkeys, Sumatran rhinos and Bornean pygmy elephants. A river safari is the best way to discover Kinabatangan’s rich ecosystem. Bird lovers will find the oxbow lakes a paradise. A great opportunity to see all 8 species of hornbill that are found in Borneo as well as kingfishers, storks and pitas. 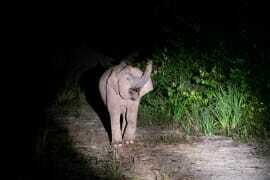 When darkness falls, join a night safari walk to seek out nocturnal wildlife in their natural habitat such as snakes, insects and elephants. Most visit Kinabatangan for 2-3 days, staying at lodges and doing several river cruises a day to maximise wildlife viewing opportunities. As you sail along the river you will often see small settlements belonging to the Orang Sungei or River People. They live self sufficiently, making a living through fishing and farming vegetables on the river banks. They use the forests that surround Kinabatangan as a source of building material, food, firewood and medicine. With a love for Attenborough programmes and a resulting curiosity in all wild animals, especially those closely related to ourselves, Borneo had been on our bucket list for a while. Not only for the orangutans but also for the bizarre proboscis monkeys that aren’t found anywhere else in the world. 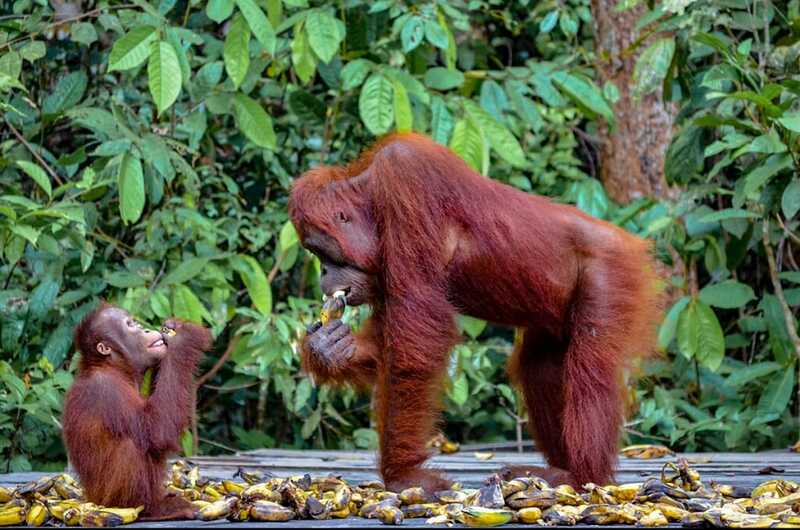 The main reason most people visit Borneo are these ginger haired apes. There are three feeding stations located within Tanjung Puting national park which are open for tourists to visit and catch a glimpse of these amazing creatures getting their fill of bananas and sugar cane. The feeding stations are typically accessed by a traditional ‘kletok’ tour, where you will stay on a private boat for a few days, cruising through the Bornean jungle and stopping off at each of the stations to spot them. We visited each of these once during our two-day tour and every time were lucky enough to see quite a large group of orangutans, giving us the opportunity to get some phenomenal shots as they swung in the trees above us and clambered down to grab a stash of food. Despite the supplementary feeding, these orangutans are completely wild, so there is always a risk of not seeing them! The remoteness of the rainforest along with a viewing of some of its magnificent inhabitants truly makes for a life-changing encounter. Note: Indonesian government is planning to close Komodo island to tourism from 2020, to mitigate the effects of overtourism on the island’s ecosystem. At present, there are no plans to close Rinca island. 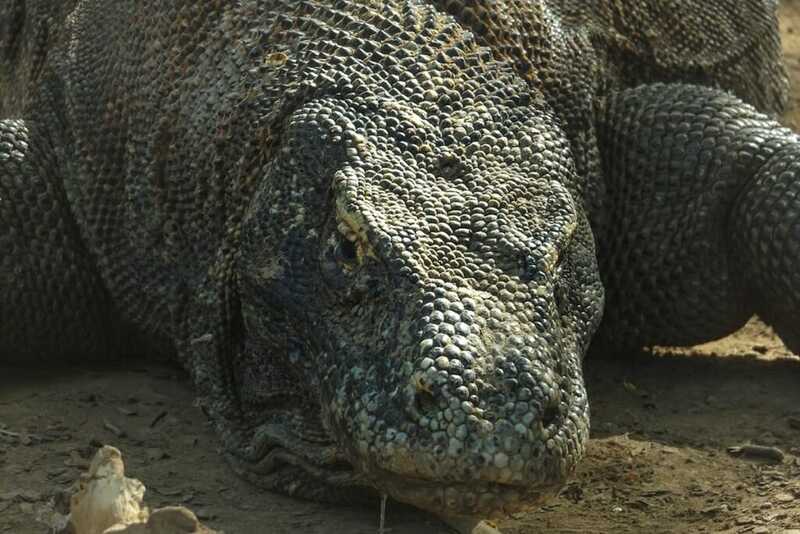 Before we saw Komodo dragons in the wild, we thought we’d seen big monitor lizards. We were living in Thailand and there are plenty living in the canals around Bangkok. However, seeing their big brothers, the Komodo dragons, had always been on Kris’ bucket list, since reading the excellent book – Last Chance to See. Komodo dragons only live on a few islands in Indonesia, which are all part of Komodo National Park. Visiting them requires a guide, as they can be dangerous. Tourists can see them on both Rinca, and Komodo. The advantage of Rinca is that it’s closer to Labuan Bajo, on Flores, where boat tours go from. They are also on Komodo, which is further away and requires a speedboat or a long boat trip. We did both trips. The Komodo dragons on Rinca were quite sleepy when we saw them, whereas those on Komodo were wandering around, which was much more exciting. Both experiences were excellent, however. There is nothing quite like seeing them for the first time. They are just so huge! We trekked across the island and one ran in front of us. Kate nearly fell over one lying in the sun. We walked into a clearing where four huge dragons were resting. We approached them for a closer look but then a couple stood up and started walking around. Pretty scary, even with our guide with his stick! One of the best and easily accessible spots to see a good variety of wildlife in Thailand is Khao Yai National Park. It is close enough to Bangkok to visit on a day tour. Although to properly see the park, it is best to stay in one of the local guest houses for a few days. In Khao Yai, you start seeing wildlife as soon as you drive into the park. Pig-tailed macaques often sit on the main road. Before you even reach the park’s headquarters you’ll probably see the White-handed gibbons and giant squirrels. The open lawns of the headquarters are good for Samba and barking deer. 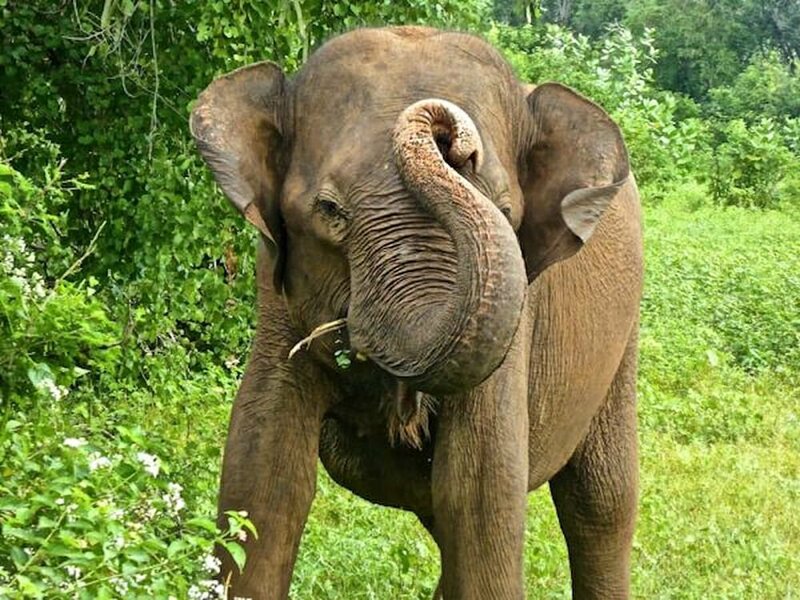 Most people come to Khao Yai for the chance of seeing wild Elephants. These forest-dwelling giants can often be seen walking along the park’s roads and at mineral licks. The park is also home to Thailand’s largest population of hornbills. Many guided tours to Khao Yai include a bird watching hike through the forest. And the hike is also a good opportunity to see some cool reptiles, like brilliantly-green pit vipers and colorful lizards. If you are staying for more than a day, make sure to take the Bat tour to watch millions of Wrinkle-lipped bats emerge out of the cave and spill over the countryside like a giant undulating blanket. Often overshadowed by the other continents in terms of wildlife watching opportunities, Europe is home to almost 500 National Parks. These parks harbour a wealth of wildlife that you can explore on your travels. 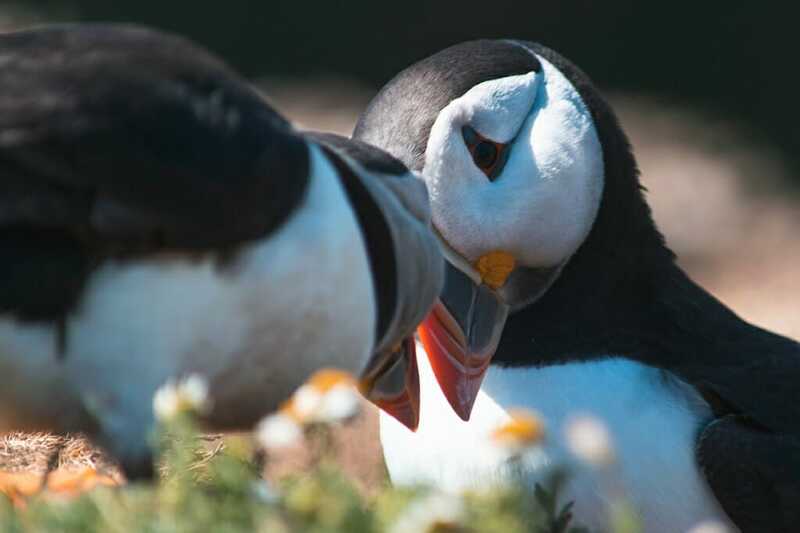 You might not think of the UK as a typical wildlife destination, but hear me out…  Some of the largest populations of Atlantic puffins and grey seals call the British Isles their home for at least some of the year, and the chances of seeing majestic birds of prey are far greater than you would expect. All of this from a tiny island where you can augment your wildlife watching trips with visits to buzzing cities like London and historic Oxford. Though you can’t head out on a traditional safari in the UK, many of the best wildlife spotting opportunities happen by foot or by boat. As all of these experiences involve seeing animals in the wild, it’s your responsibility to treat them with respect – it’s called the wild for a reason! Simply by walking through Richmond Park in London, you’ll spot hundreds of red and fallow deer roaming free. Head to the Cornish coast for boat trips to see dolphins, or to the Farne Islands to admire hundreds of grey seals and marine birds. Or if you’re visiting the Scottish Highlands, join a tour bus or simply hire a car to be spoilt with glimpses of highland cows, red squirrels and eagles as you journey through its spectacular countryside. Now, if that hasn’t convinced you that there are some fantastic opportunities to spot wildlife in the UK, I don’t know what will. I visited  Västmanland in Sweden  a few years ago and quickly fell in love with nature there. The area is also rich in wildlife and so I couldn’t miss out on the opportunity to go moose spotting! Moose is a native animal to Sweden. Since the animals are nocturnal, you’re going to watch them at dusk. They are also highly sensitive, can hear any little noise and smell an intruder from hundreds of meters afar. 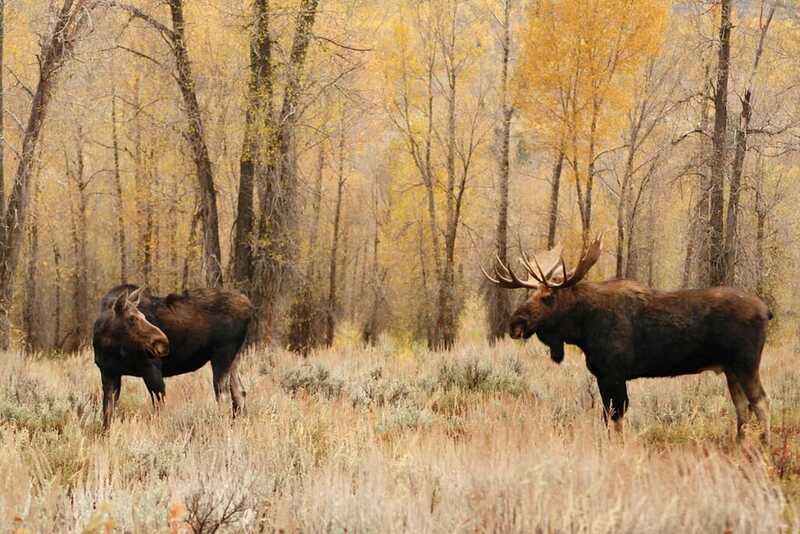 You have nearly zero chance of spotting a moose in the wild on your own. That’s why safari is the best option. The whole safari experience starts off with a leisurely walk in the forest, observing all little details and thinking what might have happened were based on traces left on the ground and on the trees. Afterwards, it’s about setting up a fire by the lake and enjoying a lovely homemade sandwich for dinner. After that, when the dusk was setting in, we’d grab the provided binoculars and slowly drove around the countryside. We were able to see a few moose from the car. At one point, there were several animals just casually strolling in a field. We got out of the car quietly and just watched in awe. In the Mercantour National Park, you will be astonished by nature and biodiversity. The Mercantour park, located in the South East of France is one of the 10 National parks in France and probably the most diversified, in landscapes, fauna and flora. Some popular sites in the Mercantour are the Allos Lake and the Vallée des Merveilles, known for its prehistoric engravings. In 2013, the park became a UNESCO heritage site. Its most famous (or infamous) inhabitant is the European wolf. 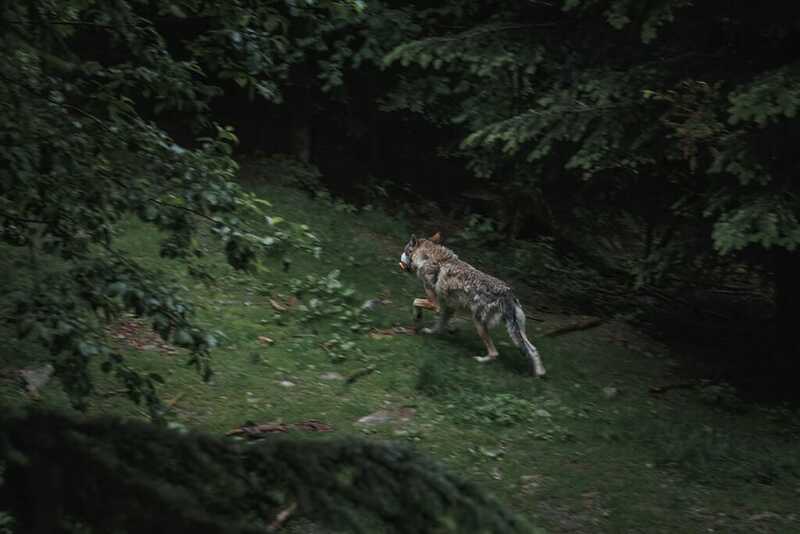 The wolf has been reintroduced in the 90s and nowadays is protected in the region to the great displeasure of local farmers. You can see the wolves in the wilderness of the Mercantour, but you will have to be extremely lucky. Another solution is to go to the Wolf Park where wolves live in a semi-freedom and where you can learn about these beautiful animals, often hated and hunted by humans. The park helps their conservation and aims to extend for other wolves species and larger territories for them. A few cubs were born in this park but unfortunately, they don’t reintroduce them to complete wilderness afterwards. We particularly like the Mercantour for the wolves but also for the birds and the other animals like the marmots who live completely free in the park. If you go to South of France, visit the Mercantour, it’s very special, not like a traditional safari destination, but you will enjoy wildlife and appreciate the amazing landscapes by simply going on a hike. One wild and rugged island sitting in the middle of the North Atlantic Ocean is home to the largest population of European Storm Petrels in the world. Nólsoy in the Faroe Islands is a hidden gem as it is unknown by many visitors, yet should be on the radar of all bird and wildlife  watchers. 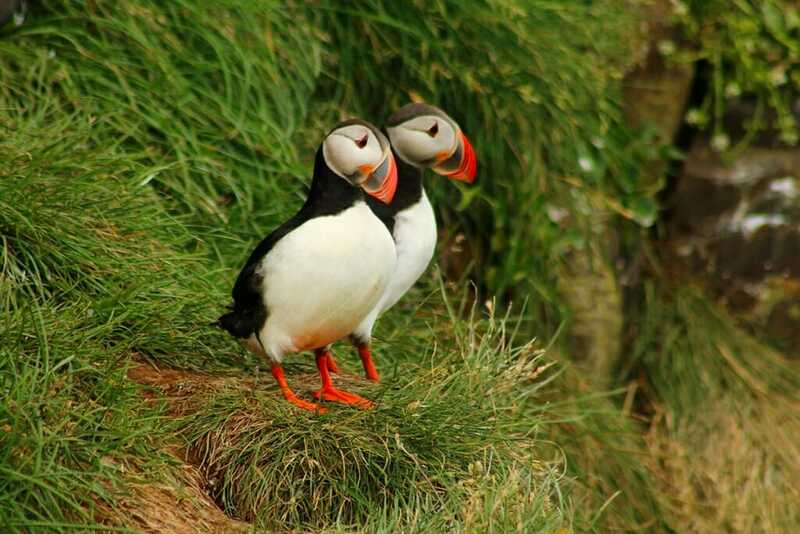 As you make the one-hour twilit hike from the village of  Nólsoy to the island’s bird cliffs, the local guide and ornithologist tells of the island’s local history and the importance sea birds play in the environmental and cultural components of the Faroes. Atlantic Puffins and other sea birds can be heard and seen retrieving their last meals for the night. Soon, as dusk grows darker, the burrows surrounding the trail come alive with the sound of Storm Petrels calling out, the noise almost frog-like in nature, getting ready to head to the ocean to forage for food. By midnight, the air fills with thousands of birds, and with the midnight sun just peeking under the horizon, the glow makes the experience almost ethereal. Guided tours and accommodation can be booked directly with the village’s Bed and Breakfast, Kaffistovan. The Danube is the longest river in the European Union. Located in Romania, the Danube Delta is a wildlife haven. Home to hundreds of bird species, this UNESCO World Heritage site and natural reserve offers you the chance to see great white pelicans, glossy ibises, red-breasted geese, cormorants, storks, herons, egrets, swans, pochards, and wigeons. 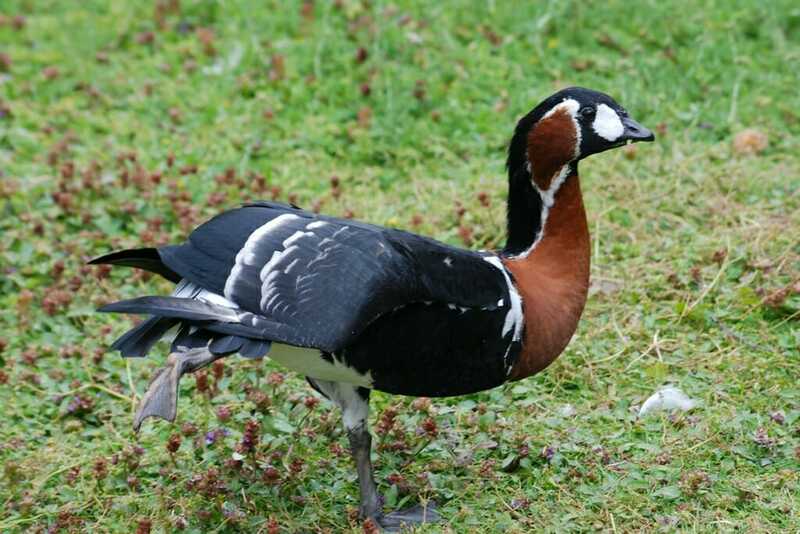 Many of these bird species come to the Danube Delta to breed. You can find accommodation in a floating hotel and take birdwatching and fishing trips in small boats. You’ll navigate along narrow channels to see the amazing fauna and flora of the second-largest river delta in Europe. The beauty of this safari adventure is that it enables you to experience the peace and the tranquillity of wilderness in absolute safety and without affecting the natural habitat of the wildlife or the balance of this fragile eco-system. Late spring and early fall are probably the best periods to visit the Danube Delta, as it isn’t too hot and there are less mosquitos than in the summer. Migratory birds arrive in large flocks in April-May. By June, water lilies blossom, turning the river channels and the lakes into a fairytale-like realm. Make sure you plan at least three-four days for your stay. If you want to taste some amazing fish dishes, have lunch with the locals. There are some nice ladies that cook for visitors. They will welcome you with tasty food and a smile, so you’ll never forget your wildlife holiday on the  Danube Delta. Australia is perhaps the most unique continent in terms of wildlife diversity. The majority of Australian mammals, reptiles and amphibians are endemic to Australia, meaning they do not occur anywhere else. From the egg-laying mammals and marsupials to the giant birds and colourful parrots, Australia is a wildlife watching paradise. The northern half of Australia’s Northern Territory, also known as the Top End is closer in climate to Asia than to the rest of the Australian continent. It is the world of seasonal wetlands, waterfalls and dramatic gorges inhabited by an astonishing abundance of wildlife. The best place to get up close and personal with wildlife in the Top End is the spectacular Kakadu National Park. The park is home to 280 species of birds, about a third of all Australian birds! It is an internationally important bird area, with many migratory species travelling here from as far as Siberia and Japan. You can see wildlife anywhere and everywhere in Kakadu. Every single body of water is bound to be home to the enormous saltwater crocodiles. Harder to find are the smaller freshwater crocs. The most famous bird in Kakadu is the Comb-crested Jacana, known as Jesus birds for its apparent ability to walk on water. 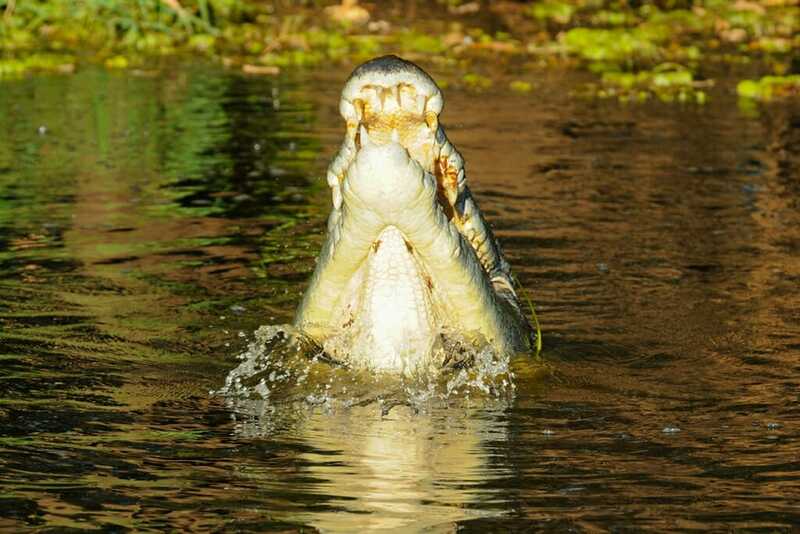 To see them in action, take a cruise along the Yellowater Billabong at Cooinda. Both morning and afternoon cruises are fantastic for spotting the crocs, jacanas, white-breasted sea eagles, jabirus, magpie geese and a plethora of other species. Australia’s Red Centre is a vast arid region in the center of the continent. Wild and remote, it is the world of endless blue sky and red sand dunes, scorched by the merciless sun. It is home to some of Australia’s most iconic geological formations, like the Uluru, Kings Canyon and the MacDonnell Ranges, as well as to unique assemblage of weird and wonderful wildlife species. There are the terrifying-looking Thorny devils, the kangaroo-like hopping mice, enormous Wedge-tailed eagles and even burrowing frogs – the unique amphibians that spend most of their lives underground. Most of these creatures are not hard to spot even in the touristy areas if you know when and where to look for them. Keep an eye out for the hopping mice at Uluru after watching the sunset. Thorny devils and eagles are easiest to spot on the side of the road as you drive between the attractions. And to spot the burrowing frog, dingoes and dunnarts, take a spotlight walk after dark. Choosing just one place for wildlife spotting in Australia is difficult. Especially when you consider the vast amount of unique wildlife there and how widely it’s spread across the continent, just one tour or safari will never be enough to cover it all. From the rarely spotted Platypus to Salt Water Crocodiles, Cassowary and an abundance of other tropical wildlife, we’ve been able to spot all of these in the wild without the need for a tour in Far North Queensland. Having our own car opened up possibilities for us to explore the lesser known areas of FNQ, and it thank’s to local knowledge that our animal encounters have been so natural. Being able to sit on the top of a hill, just us two, and watch crocodiles basking in Eubenangee swamp below, completely undisturbed, was a million times better than paying to sit on a boat, waiting for a baited croc to jump out of the water. Sitting on the beach and witnessing a Cassowary and his baby chick casually walk out from the sea-side jungle onto Etty Bay Beach. Not because he’s being fed, like in other beach towns, but because that’s his normal routine and that’s where he’s protected. 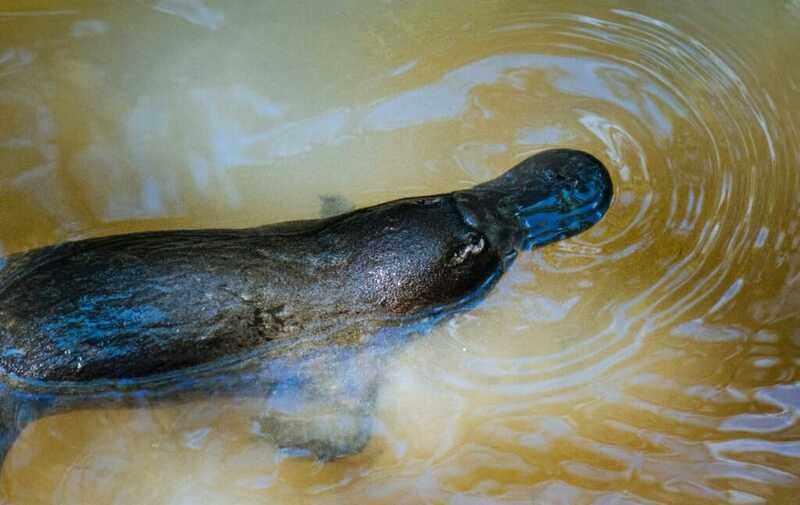 And lastly, in the Atherton Tablelands, we found a small creek that is home to a cluster of shy Platypus. It’s a more well-known spot than the other places, but Peterson Creek we were able to sit for almost an hour at dusk without anyone else around. Tip: Patience. We waited for almost an hour to find him too! Australia is a country full of incredible wildlife watching destinations, but we always find ourselves recommending one very special place: Kangaroo Island. This small island off the coast of South Australia has been described as the “Galapagos of Australia” and is full of countless wildlife encounters. You’ll find cute little Tamar Wallabies along several of the hiking trails – they are pretty much guaranteed on the Ironstone Hill hike, very dark-haired kangaroos (that look almost black) pretty much everywhere, New Zealand Fur Seals at Admiral’s Arch and the incredible experience of walking among Australia Sea Lions and their pups at Seal Bay. Even with all these amazing animals, one stands above the rest for us– the koala. 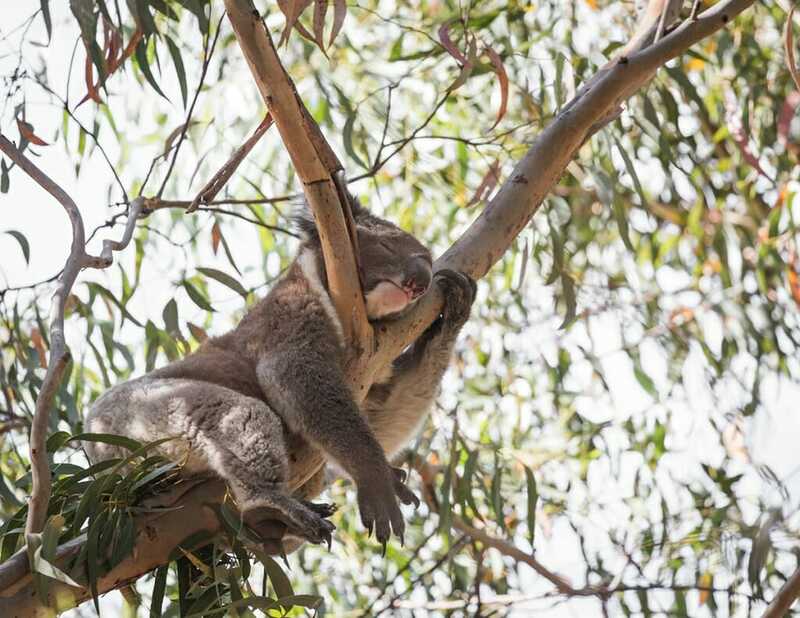 Kangaroo Island is one of the best places in the world to see a wild koala as the population here has exploded whilst the numbers on the mainland have been decimated. There are a few walking trails from the visitor centre at Flinders Chase National Park where you are very likely to see this cute marsupial up close. In a week, we saw dozens of these highly endangered animals at four different spots on the island! Kangaroo Island is one of those places where you’ll spend most of your time in awe at how close you can get to some of the most unique animals in the world, it should definitely be on your Australia itinerary. Flinders Ranges is probably the best place to see Australian macropods – different members of the Kangaroo family. Both, the Red kangaroo and the Western grey kangaroo are common in the open areas, as well as the Common wallaroo. These are all large animals, easy to spot in the grassy areas. You will have to work a little harder to find the adorable Yellow-footed rock wallabies. Wallabies are the smaller cousins of the kangaroo and the Yellow-footed rock wallaby is the cutest of them all. Being rock wallabies, they like to live on the rocky outcrops of the park’s spectacular gorges. Brachina gorge is a good place to look for them early in the morning and late in the afternoon. Watch them sun themselves on the rock and hop at high speed across exceptionally rugged terrain. It is best to explore the park is in your own vehicle and take a few days to discover different areas. You can either camp at Wilpena pound or stay at Wilpena Pound Resort. Wherever you choose to stay, make sure to take the walk to Wilpena pound – a giant natural rock amphitheatre. The first time I went quokka spotting on the stunningly beautiful Rottnest Island just off Perth, it was a proper wildlife safari. We got on bikes, we cycled miles, we stared into bushes, we didn’t see a quokka. Friends who visited Rottnest regularly looked at us strangely. 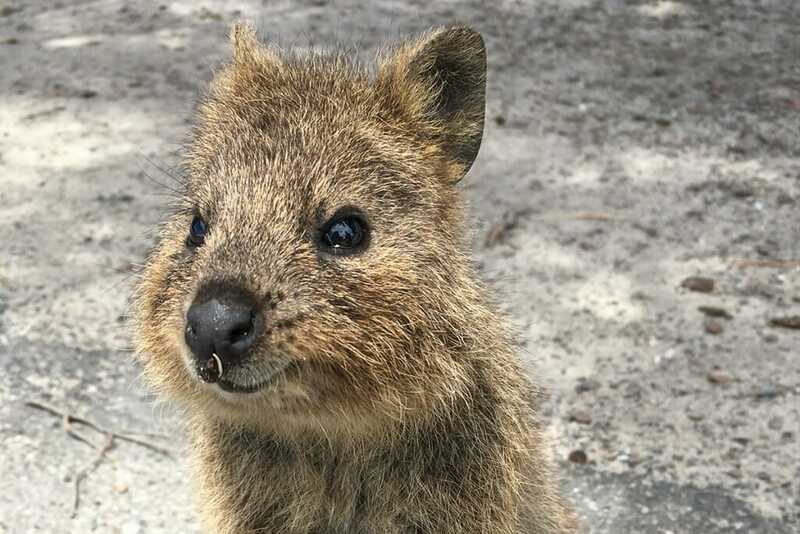 There are 10-12,000 quokkas that call Rottnest home and, with no predators on the island, they’re normally remarkably social. Turns out my first trip had coincided with them rounding up the quokkas to count them! My second visit saw quokkas everywhere; at the bus stop, in the bushes, I even had one hanging off my hair in the pub as I bent closer to take a picture. This was not a problem though as quokkas are, quite simply, the most adorable creature known to man. About the size of a cat, they have huge brown eyes, button noses and a smile. Sit down by one and it’ll hop over to say hi – and, while you must not touch them or feed them, they’ll happily pose for pictures – hence the craze for quokka selfies. You’ll find quokkas, literally, everywhere on Rottnest, especially around the shops that have installed ‘no entry to quokkas’ signs. I think these are for humans, if not, and quokkas can read they’re even more awesome than I thought. Rottnest Island is a short ferry ride from Perth , making visiting them one of the top things to do in Perth or nearby Freemantle. Ferries run regularly throughout the day. A triangular shaped island, almost the last stop before Antarctica, Tasmania is Australia’s southernmost state. A significant proportion of its land mass is a wildlife haven of protected wilderness. Tasmania’s coast is dotted with colonies of little penguins. At Low Head on the state’s north coast tour groups watch these timid creatures as they come ashore each evening to nest and feed their young. At an average height of 30 cms (12 inches) and weight of 1 kg (2 lbs) the little penguin, also called the little blue penguin or fairy penguin is the world’s smallest – and cutest – penguin. Colonies are found only in southern Australia and New Zealand. The Low Head tour begins just before sunset and consists of a short talk and an easy walk through the dunes where the penguins dig their burrows. Although you can wander around the Low Head reserve during the day, in order to protect the penguins only authorised tour groups are allowed during the hours before and after sunset. Torches (flashlights) and flash photography are prohibited. Tours are conducted year round but the penguins come ashore in greater numbers during breeding season between November and February. 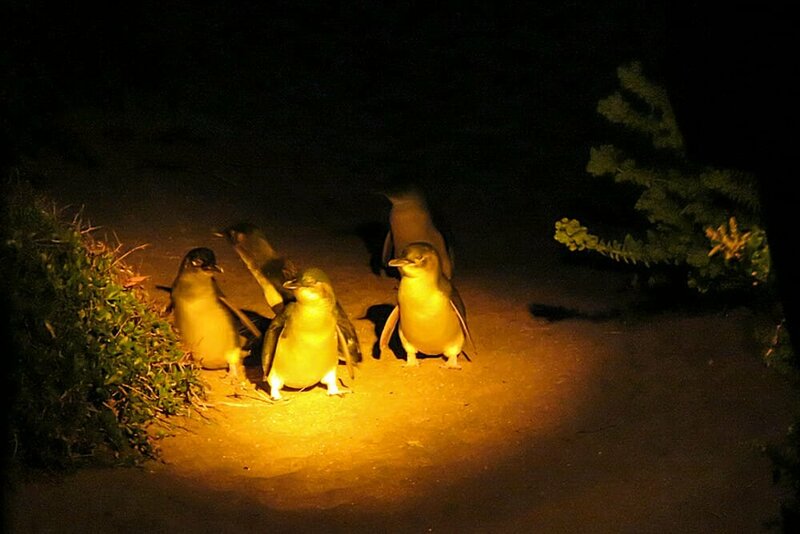 Seeing hungry penguin chicks leave the cover of their burrows in search of their arriving parents is a highlight. For more information on where to see wildlife in Tasmania visit The Travelling Lindfield’s Tasmania page. When thinking about wildlife watching destinations, cities don’t immediately come to mind. Yet quite a few species of wildlife are able to tolerate the disturbance of the urban environment to some degree. In Sydney, two species of possums: the Brushtail possum and the smaller ringtail possum can be seen in most forested areas. 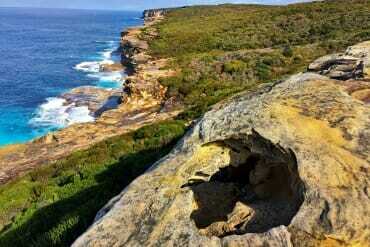 Being surrounded by National Parks, some of Sydney suburbs enjoy frequent visitors from the wilds. Eastern grey kangaroo and swamp wallabies emerge on the suburban lawns in the North Shore and in the Sutherland Shire. 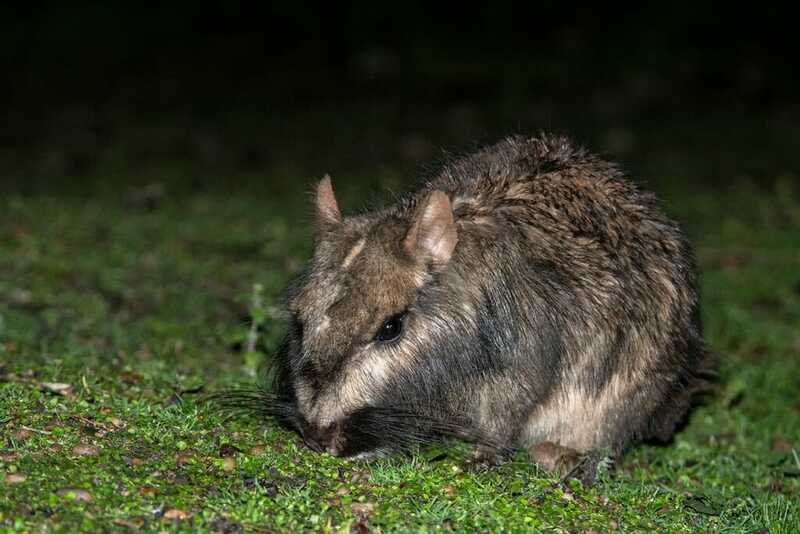 Long-nosed bandicoots occasionally dig up manicured gardens in the Inner West and Grey-headed flying foxes take over the night sky above the city centre. 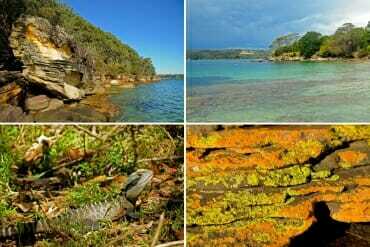 Venture slightly further out, to Royal National Park, the Blue Mountains and the Kur-rin-gai National Park and you could spot a Long-nosed echidna, a Common wombat and the adorable Sugar Gliders. Sydney is also a good place to see some of Australia’s cockatoos and smaller parrots. Take a stroll through Centennial Park and see how many species you can spot. Or if you are a serious twitcher, head straight to Mt. Annan Botanic Gardens. Of all the wildlife watching destinations, Antarctica and the surrounding islands are the most exotic and the most extreme. Not to be taken lightly, a visit to Antarctica is a once in a life time experience. One of the most amazing wildlife destinations in the world is the British Overseas Territory of South Georgia, which is home to hundreds of thousands of penguins, seals, sea birds and herds of wild reindeer brought here by Norwegian sealers and whalers. As soon as we landed, we were surrounded by wildlife. Imagine tens of thousands of Emperor penguins calling out at once. I always remember the sight of a sea of penguins, the musical sounds they made and the overpowering smell of guano. Most people visit South Georgia on a cruise ship and some adventure cruise ships stop here on the way to Antarctica. We had four beach landings at Fortuna Bay, Golden Bay, Grytviken and Stromness. Stromness was where Antarctic explorer Ernest Shackleton and his crew were rescued in 1916. At each place, there were penguins and seals everywhere we looked. In fact, most of the time, we had to be careful not to trip over the seals. One time, we landed on a beach among juvenile elephant seals that were play-fighting in pairs. The scenery is simply stunning and the ruins of former Norwegian whaling stations are overrun with baby seals. Fortunately, the stations have now been decommissioned and volunteers from the South Georgia Heritage Trust are slowly restoring them. If I could choose just one place in the world to go back to for a pristine wildlife experience, South Georgia would be my pick! What is your favourite wildlife holidays destination? Share your thoughts in comments below. It is addictive! Once you experience wildlife up close, you start wanting more of it. We were just talking about a safari in India. It’s never seemed like a country I would enjoy visiting, but I do love safaris and I love the idea of seeing a tiger in the wild! I am still on the fence about India. Most of the country is complete chaos, but once you get to the national parks, the wildlife watching is superb! I’m so glad you put Udawalawe National Park in Sri Lanka on the list (but also I hope the secret doesn’t get out and turn it into another Yala!) I had the best experience there. I went in the off season and got to the park as soon as it opened. Immediately came upon a herd of elephants with one very playful baby and got to sit there watching them just after sunrise without a single other tourist in sight. It was amazing! That’s beautiful. Early mornings are the best – animals are active and not many visitors. Problem with Yala is that it is a part of every single commercial tour to Sri Lanka. Half the people on those tours are only there because its part of the program. So hopefully, if the other parks become better known and the marketing is adjusted, then the visitors will disperse between a higher number of destinations. 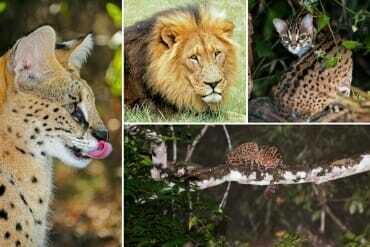 Wow I would love to see some of these safaris! Your pictures are absolutely stunning! Wow, I actually never thought that we have Safaris in Europe haha. This article actually opened my eyes that we can do Safaris around the globe. I need to check these in Asia, so I can explore some of them before coming back to Europe. I am glad the guide is useful! There are so many options for wildlife spotting, you can find one wherever you are! I never knew there were so many options! Great inspirational post, my difficulty now is choosing which ones to try and visit, and in saving for the trip! I love this!! I’m going to be using all these Asia ones during my trip this fall! Would you recommend Indonesian Borneo or Malaysian Borneo if I am looking for less tourism and also the best chance at seeing alot of wildlife?? I am having the hardest time finding a post that helps me decide between the two! I would definitely recommend Sabah in Malaysian Borneo. Kinabatangan River is perfect for seeing the wildlife up-close. Orangutans, Proboscis monkeys, hornbills, Pygmy elephants…Try to take at least one night cruise for the chance of spotting nocturnal species. For the rarer species, Deramakot Forest Reserve is a must. 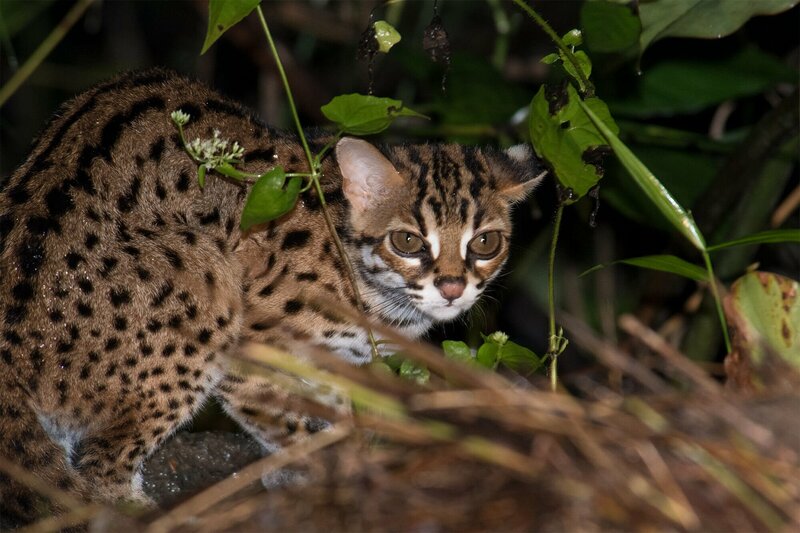 It is the best place to spot a Clouded leopard, marbled cat, and even a Sun bear if you are lucky. Fantastic & really comprehensive post. I thought I’d done a lot of safaris but clearly lots of places around the world that i still need explore. Thank you! Thanks, Katie! I completely agree – Africa is the top continent for wildlife adventures, that’s why it has it’s own post. This guide is divided into two parts to keep its size manageable. Australia always gets my vote as well :). We may not have big cats, but the critters we do have, you can’t see anywhere else. 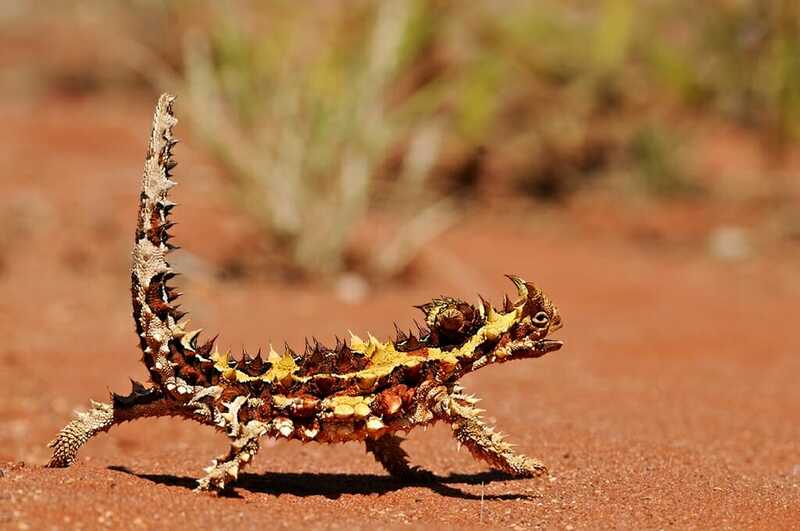 I mean, who wouldn’t want to see the Thorny Devil!